The Grand Hotel – America’s Summer Place! The Grand Hotel ™ has been the centerpiece of grace and elegance on Mackinac Island since 1887. It is also known as “America’s Summer Place” and it is easy to see why if you sit out on the world’s longest porch and overlook the whole island below. This is the view of the hotel from the Arnold Ferry as you approach the island. The view from the lawn is even more impressive. Don’t forget to drop by at night. The entry to the hotel (under the small pointed roof in the center of the hotel). No visit to the island is complete without coming here. You can also come dine in the main dining room or any of their other restaurants. See list here of their many dining choices. 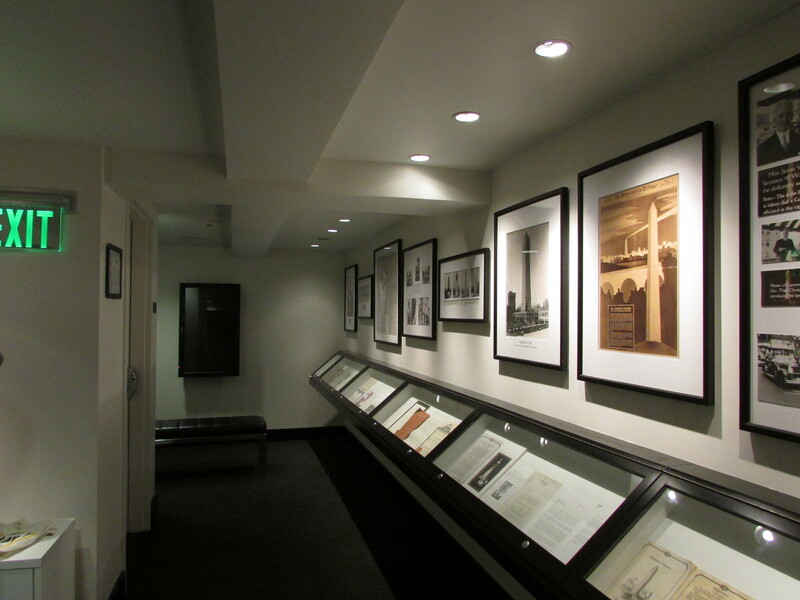 If you wish only to take the self-guided tour, it is $10. Every day, a schedule of events is posted for hotel guests. No expense is spared in decor or any aspect of amenities to cater to the guests’ every need or desire. Even transportation, the Grand Hotel has it’s own horse and carriage to take guests to ferry docks or pick them up from there. We looked forward to enjoying the hotel’s famous luncheon from 12-2 PM then taking the tour of the hotel and grounds. We arrived at about 12:20 and were seated in the main dining room by the window with a view of their famous porch, thanks! The view was breathtaking, especially when the freighter Presque Isle from Duluth, MN chugged by. The views were just as impressive inside the dining room, and the food was almost too pretty to eat. You could hear a guitar being played in the background during the meal. Let’s listen in! A further look at the dining room, the decor even looks like summer. This is the entry into the dining room, looking West. This view is toward the back of the dining room. I noticed the ceiling is the same shade of blue as the porch roof. There are many mirrors in the dining room, making it look even larger. The plates have a beautiful flower on them. We began our tour after lunch, there is much to see here! We began in the main lobby where we came in. You can also get a map of the hotel so you don’t get lost. 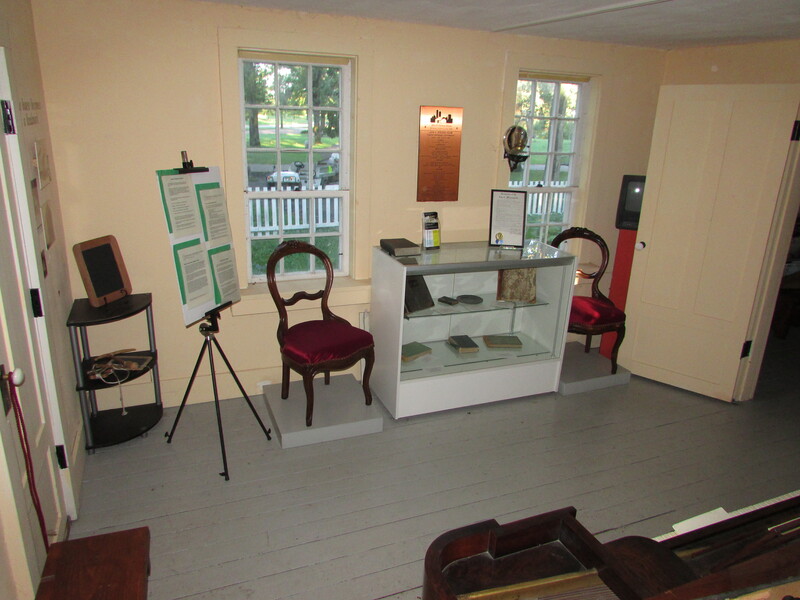 In the small display case on our left is an original dinner plate the Grand Hotel used in the 1880’s. A view looking toward the West Wing of the hotel from the lobby. Just ahead of the center of the lobby is the Grand Ballroom that you can book for your own event. On the left is the relaxing Audubon Wine Bar. The lighting inside is very creative. Boot lamps and grapes, they look so perfect for this room! We continued our tour upstairs at the Cupola Bar. The windows wrapping around 3/4 of the room offer a panoramic view of the island below, as well as the Straits, Round Island, and the swimming pool below. It is quite possibly the highest and most interesting views of the island. Dare I say it, “stairway to the stars” leading up to it. The chandelier is beautiful too. After admiring the view, we continued downstairs on the ground floor. 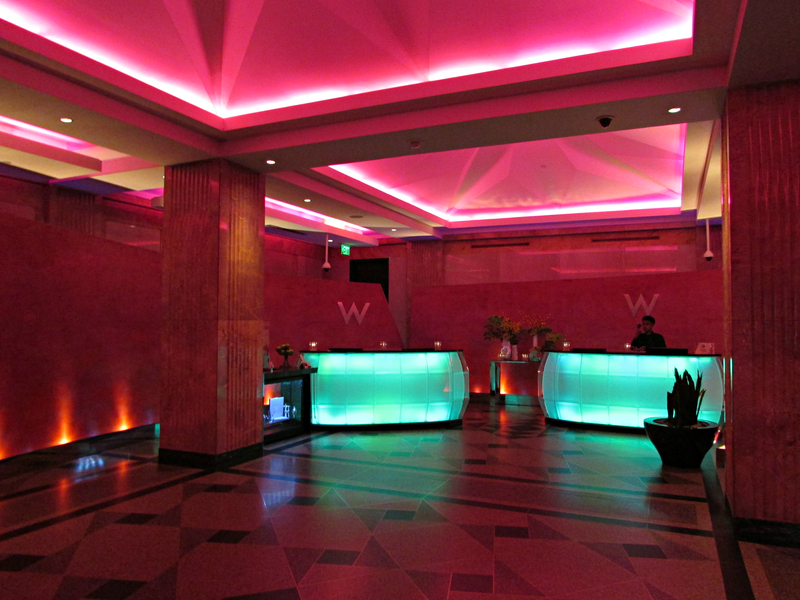 The hotel check-in desk is to the right of the stairs. On the left are the boutique shops. The Grand Hotel is also well known for being the main filming site of the movie, “Somewhere in Time” starring Christopher Reeve and Jane Seymour. The hotel pays tribute to this each year by having a Somewhere in Time weekend, in 2016 it is October 28 to 30. For those who can’t make it, there are some artifacts from the movie on display on the ground floor. The Bowler hat Christopher Reeve wore. A collage of pictures taken during filming. A portrait of Elise as seen in the movie. Our tour concluded outside, where we read the historical marker outside and took our picture by a red English phone booth near the golf course. Great photo-op! Horse and buggy topiary adorn the Great Lawn. We hope you enjoyed seeing our visit to the Grand Hotel. Catch a summer breeze on the longest porch in the world and enjoy the view! 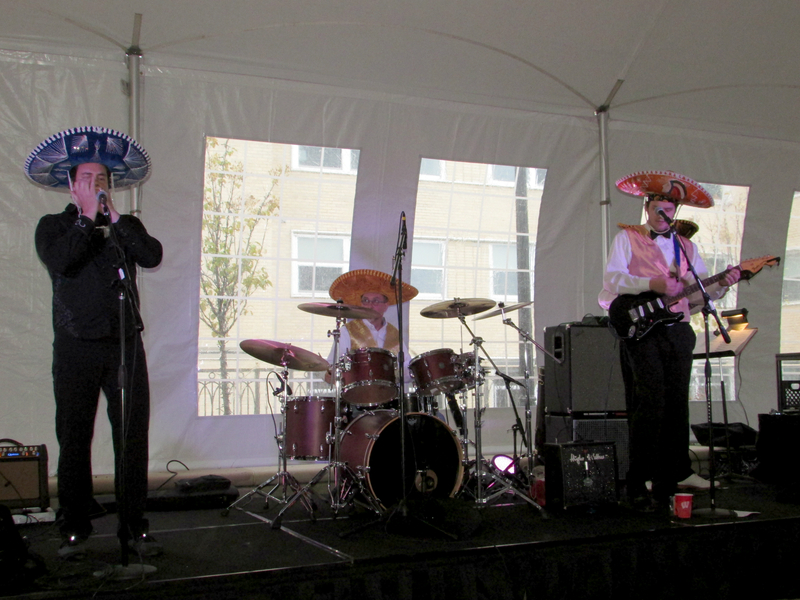 With the rebuilding of the Edgewater Hotel came new traditions for people to celebrate the seasons here. 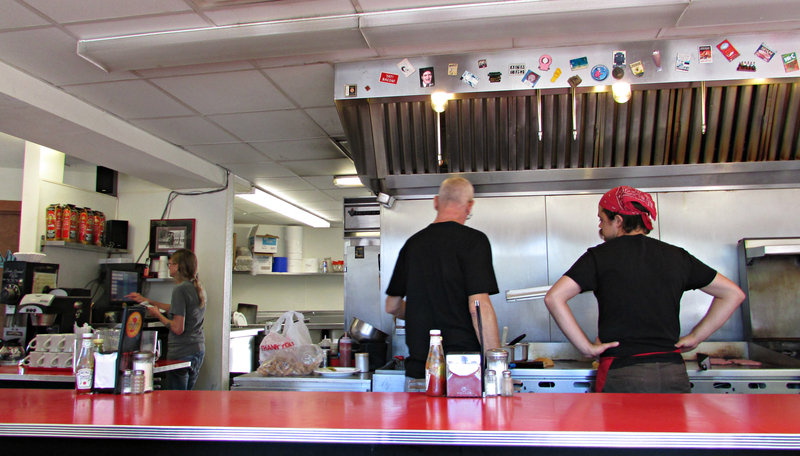 In 2014 the Edgewater re-opened after an extensive 2-year expansion and remodeling. This year we were able to attend their 2nd Christmas Tree Lighting ceremony and festivities beforehand. No ice skating since we had two days of warm rain that week and the ice all melted. Here is that day’s schedule. Upon our arrival just before 5:00 PM we saw the conclusion of the mini-concert on the winding staircase. Let’s listen in! 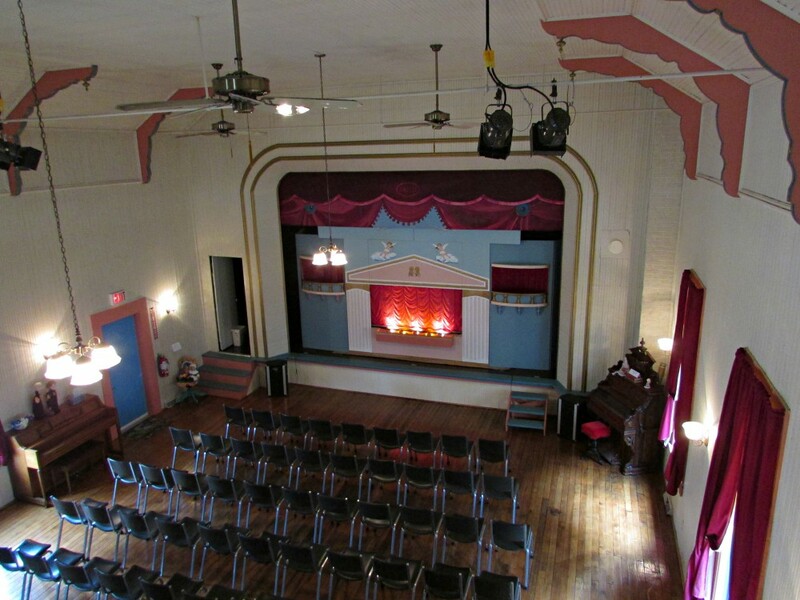 Part 2 of the concert took place in the adjoining Ballroom, made to look like Santa’s Village. There were now hand bells joining the chorus. They played a lot of great music for 1/2 hour. The concert was fantastic! It was now time to head outside to await Santa and Mrs. Claus to arrive and light the trees outside. It was cold and windy that night. The outside of the hotel was festive with lighted garlands and LIGHTED ice sculptures to make it a wonderland! The crowd has swelled to fill the Plaza, Christmas music fills the air. The three trees sit dark, waiting for Santa and Mrs. Claus to arrive. We hear jingle bells, they have arrived in a horse and carriage! They were moving fast toward the trees, posing with some of the children along the way. The moment we anticipated all day was here, lets watch! NOW we can begin the Christmas Season in earnest. Just as swiftly, the Clauses departed in their carriage and waved goodbye to the crowd. No doubt they were needed to light more trees elsewhere. At this point bagpipers came in to close out the ceremony. The crowd was dispersing at this point, it was cold! We concluded out visit with dinner at their Boathouse restaurant, fish fry basket was delicious! Ken Wheaton and Mike McCloskey were playing some great music while we ate dinner. We heard Ken before, especially last year at Spring Green’s Beatlefest. It was a wonderful evening here, we hope to come back again for their 3rd tree lighting in 2016! We usually aren’t night people, but sometimes the most fun happens at night. On Halloween for example. 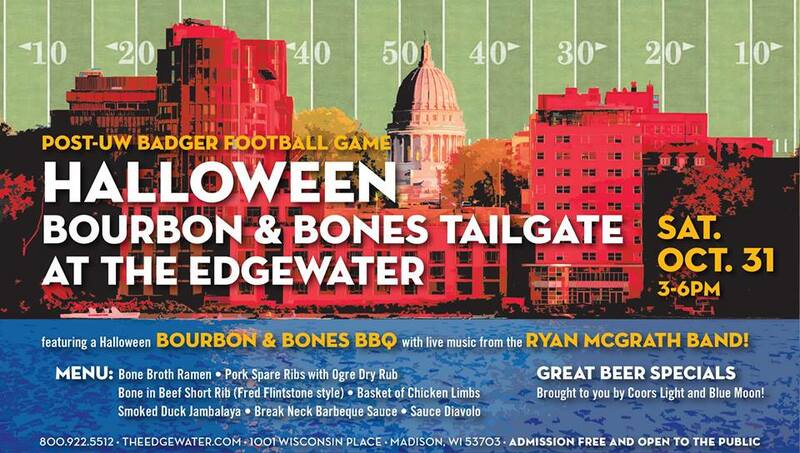 This year we went to the Edgewater Hotel for their Halloween Badger Tailgate Party held in the big tent in the Plaza. The Ryan McGrath Band played a lot of great music too. Here is a good example of their performance. There was great food too, We enjoyed Duck Jambalaya and Pork Spare Ribs. 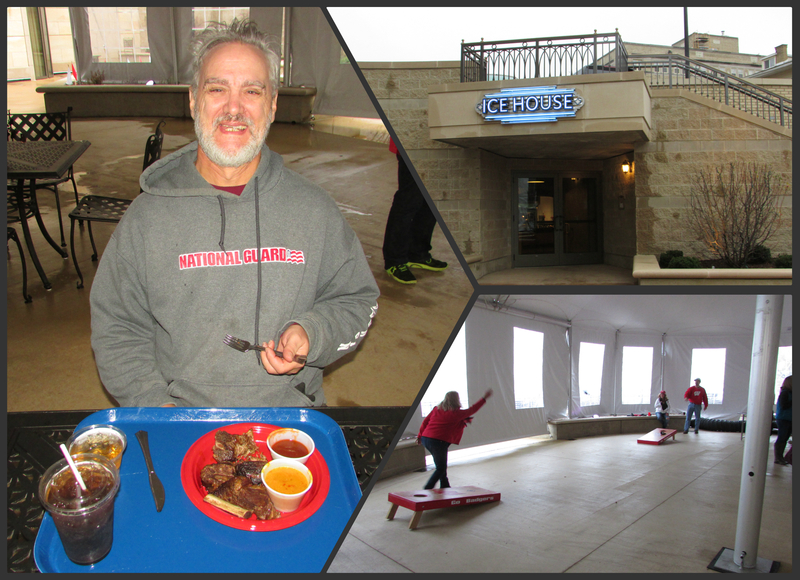 We picked up our food in The Icehouse near the tent. Al is sure enjoying the ribs! There was a beanbag game going on too. 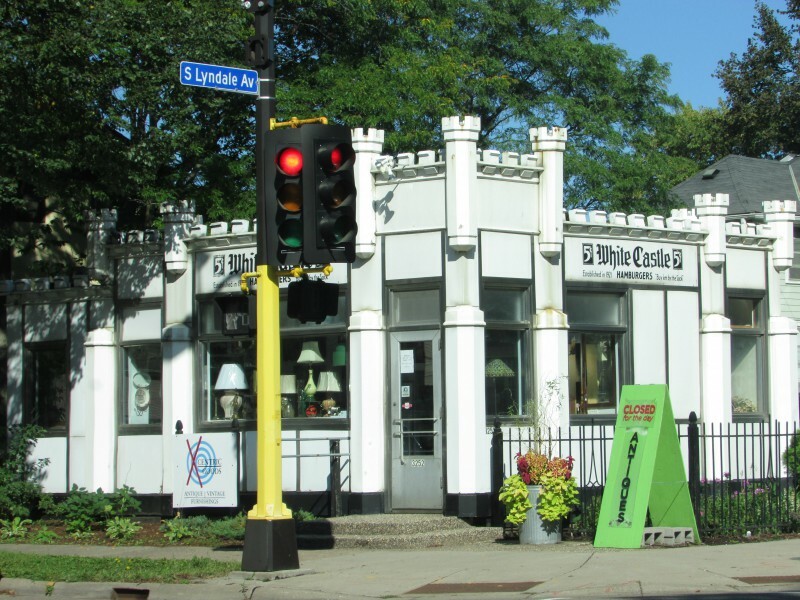 After a great afternoon at the Edgewater we went to the Westmorland neighborhood on Meyer Ave. Here are the boundaries of this beautiful neighborhood. 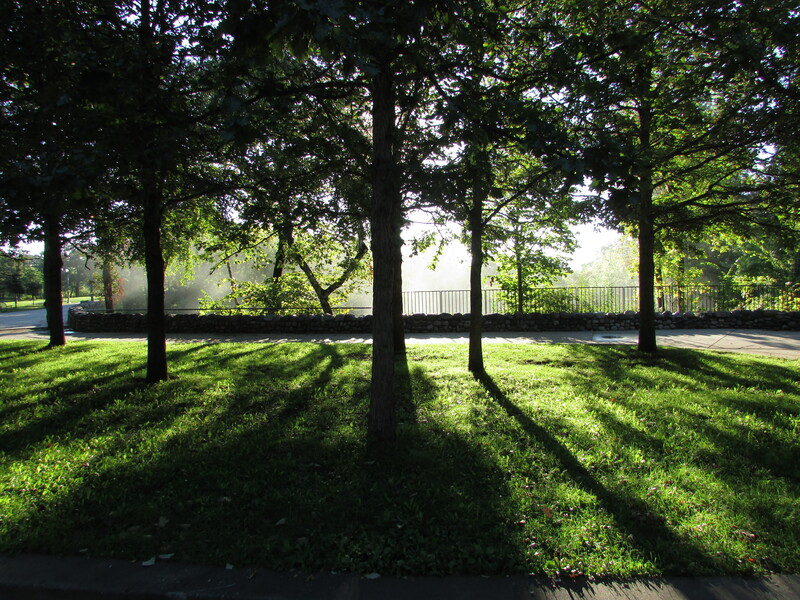 It isn’t far from the Glenwood Children’s Park. 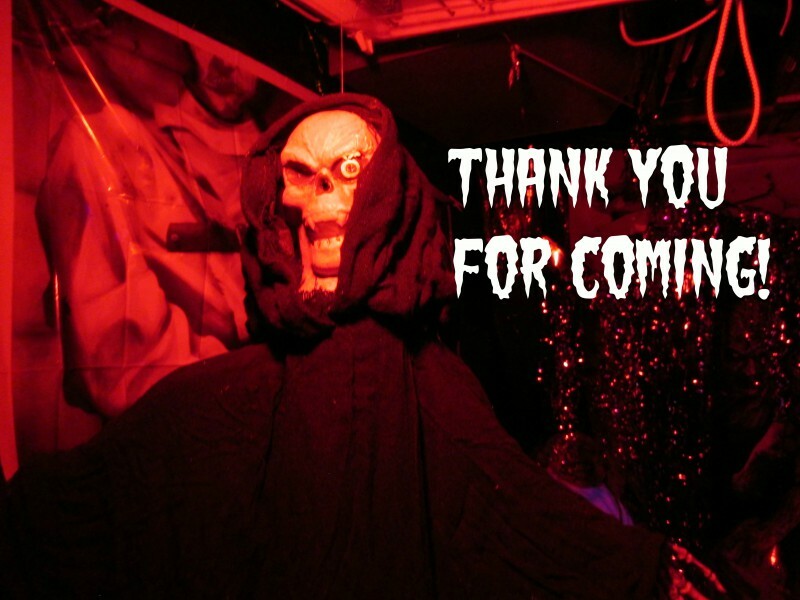 This was the 22nd year of this popular and free haunted house. The parents of a friend of ours do this just because they love celebrating Halloween. There are also a great many children around, and to hear them saying “trick or treat” all around was something I have not heard a lot of since the 1980’s. They kept the spirit of Halloween alive here. 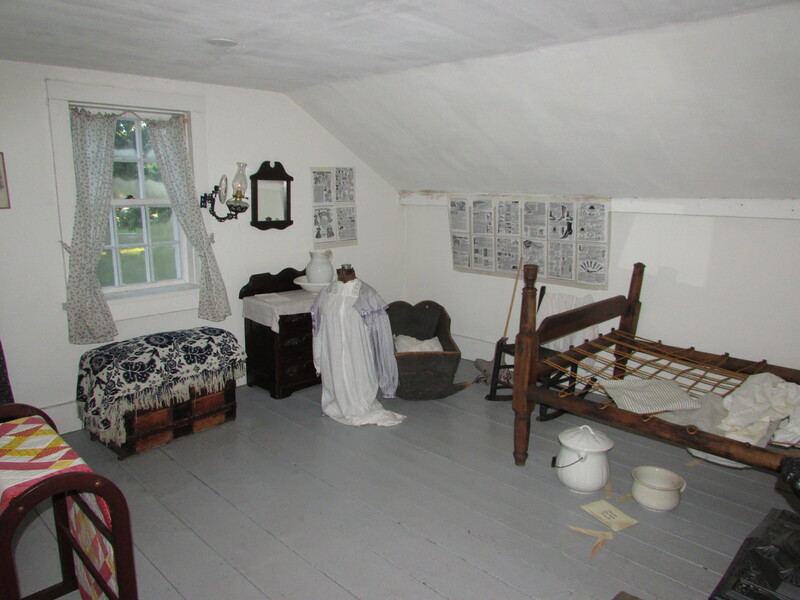 Lets go through the “haunted house” on this exclusive tour I recorded when we went there. There are no people jumping out at you in the dark, just many creepy decorations and black and red lights. One section of the video also has a flashing strobe light, making sure those sensitive to strobes are informed. Lets go, if you dare! We managed to make it through alive, and we had a great time. The house has a Facebook page if you want to see when you can go next year. This was a great old-fashioned Halloween that brought back memories of celebrating it as a child. 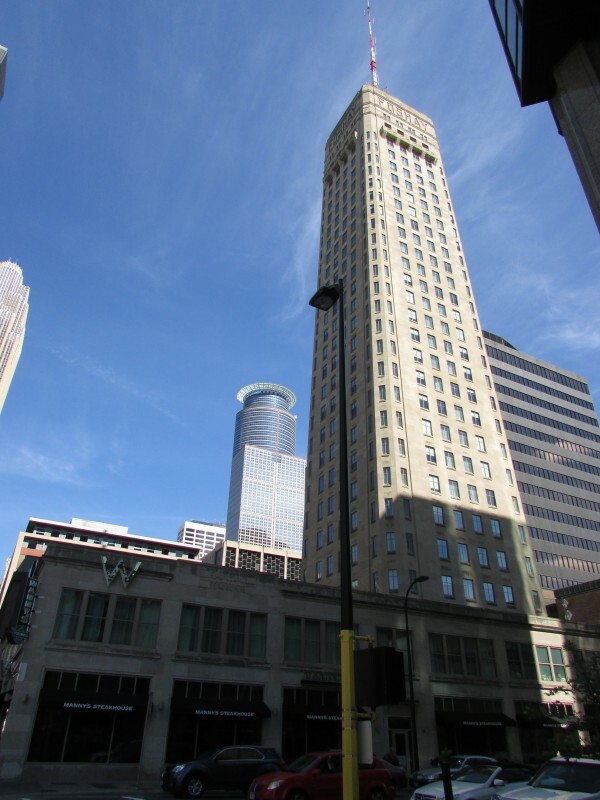 Minneapolis – The Foshay – First Skyscraper in Minnesota! 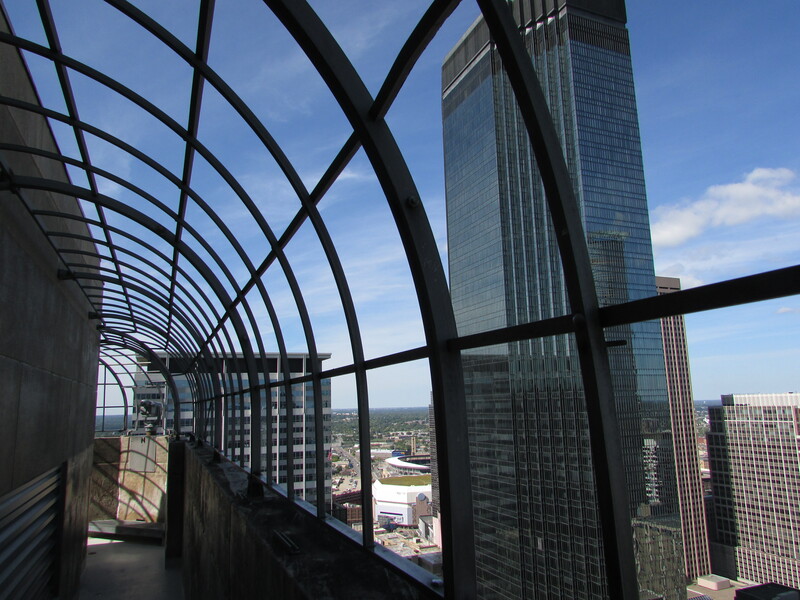 The big moment we have been waiting for, our ascent to the 30th floor Observation Deck of The Foshay in Minneapolis. It was now 1:40 PM. It has only been open 8 years so we chose a good time to visit. 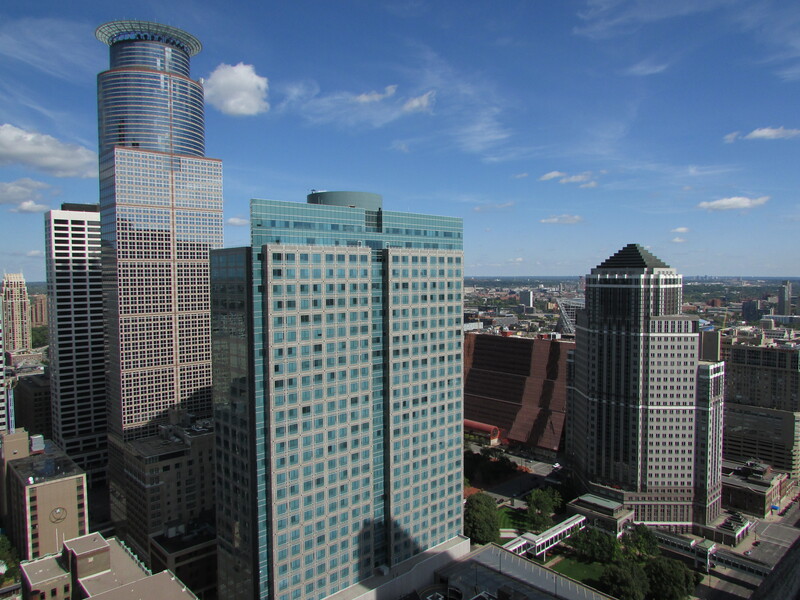 The building once dominated the Minneapolis skyline, but now it is surrounded by other taller skyscapers. Not all views are blocked however. 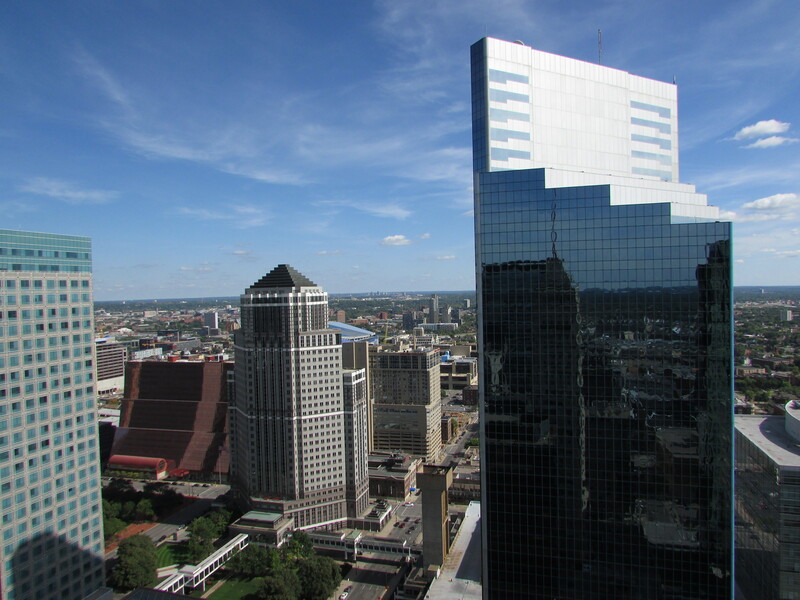 It was constructed in 1929 and named after the founder, Wilbur Foshay. See some local news coverage about the tower. 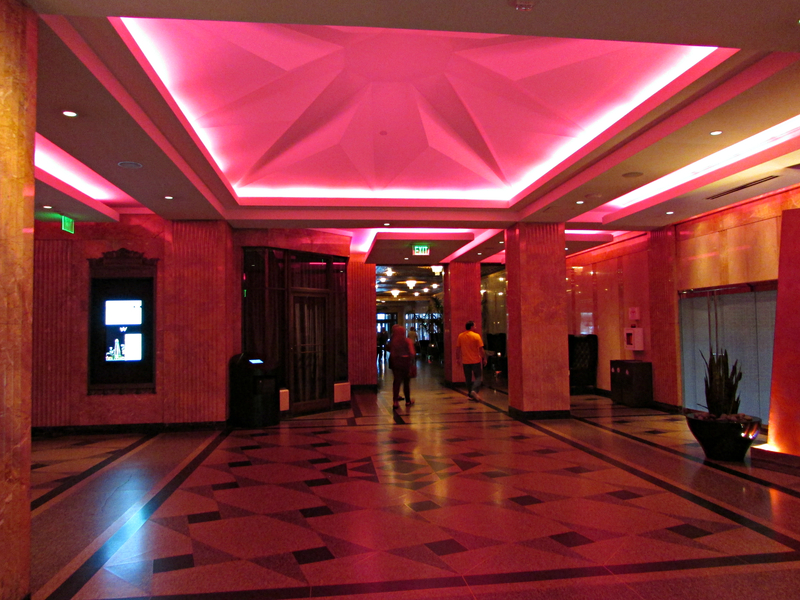 We went in to get our tickets at the desk, such cool lighting inside. 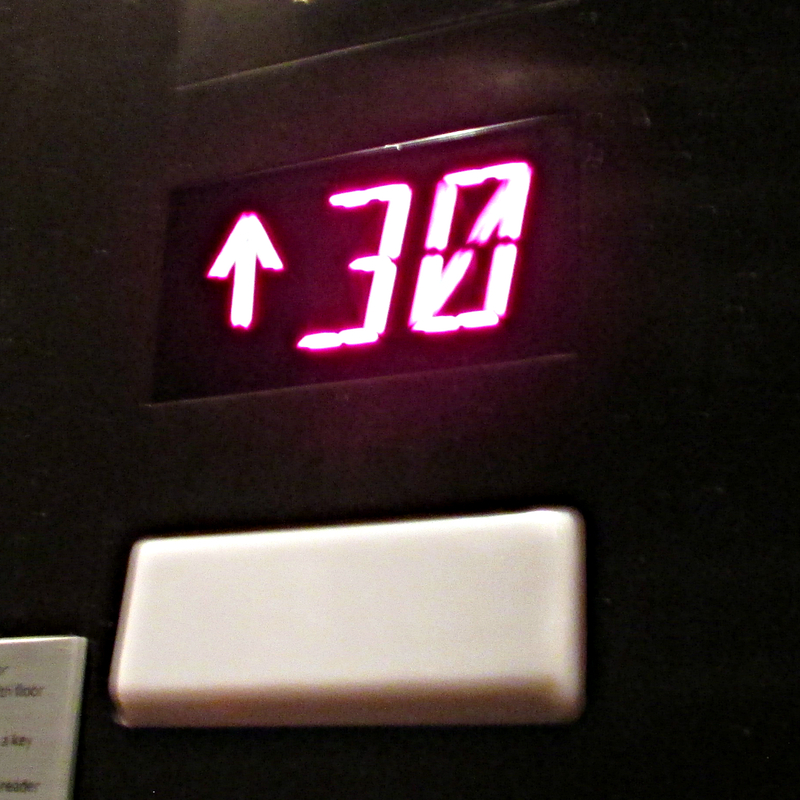 The clerk gave us a special key card to get us to the 30th floor. We’re here! 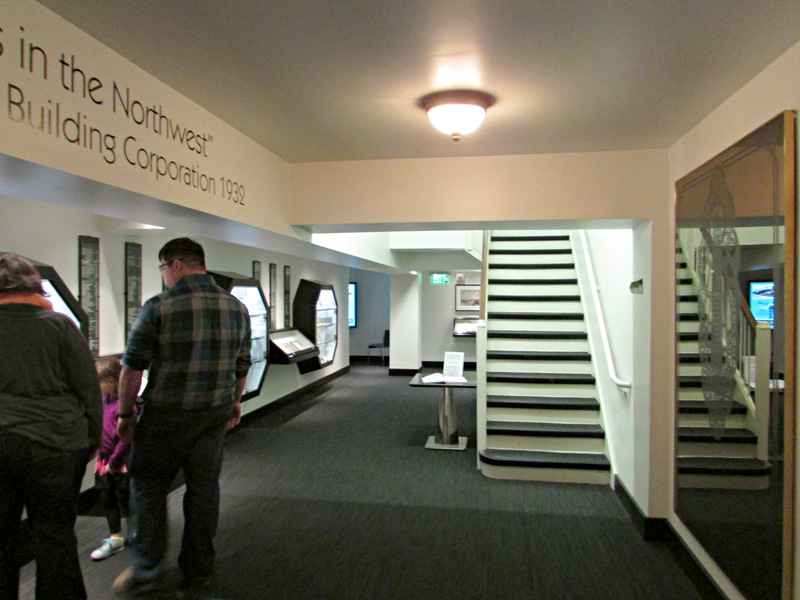 There is more than the observation deck here, we also enjoyed the museum on this floor before going out. The original program for the dedication of the building. 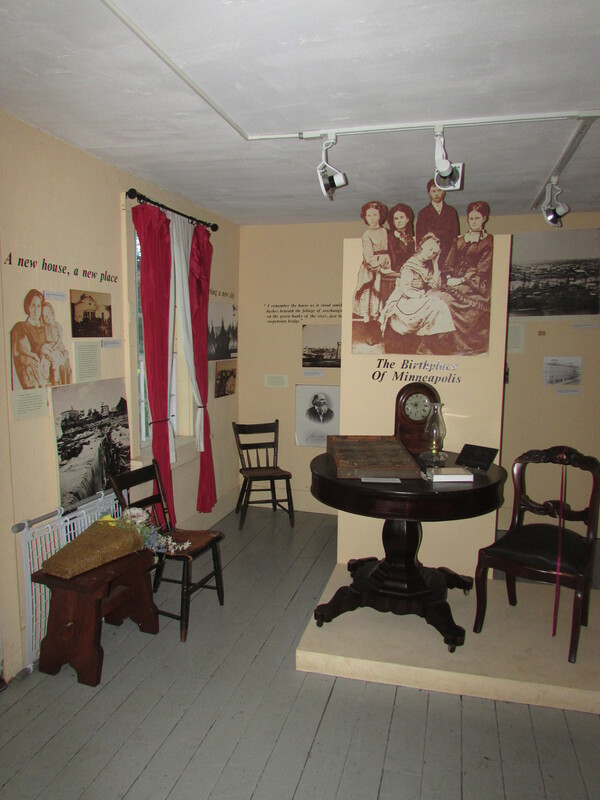 The other side of the museum. Here you can see the stairs to the deck and in the far left corner is a video alcove. We learned John Phillips Sousa was comissioned to write a special a special march to be played during the tower dedication in 1929. That was the only time this was performed for many decades. The reason being Mr. Foshay’s check to him in payment for writing and playing the music bounced. Sousa forbade the piece from being performed again until payment was made. 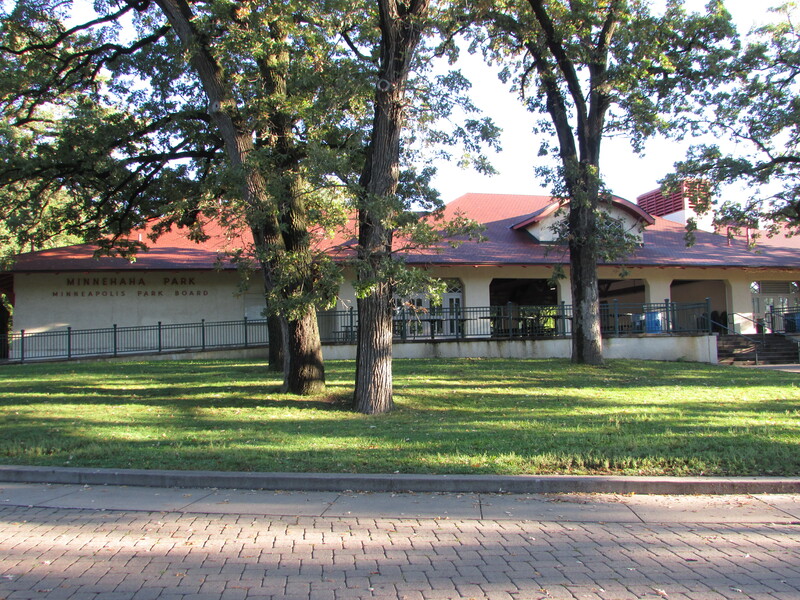 Sousa’s estate was finally paid in the 1990’s by the citizens of Minneapolis raising the money. Now you can hear it too. Now that we saw the museum, time to go out on the deck! The deck as you can see is open air and you are well enclosed. I could see places where we had been while exploring the city today. 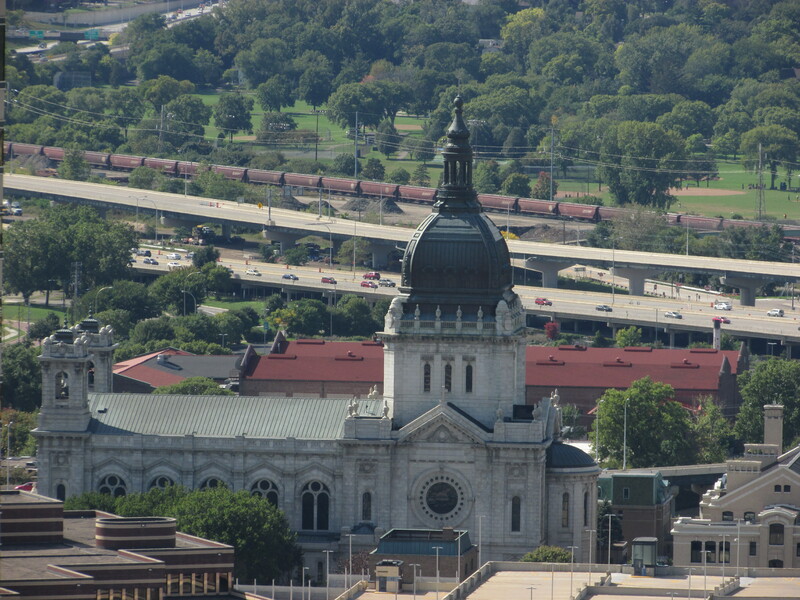 We could see the Basilica of St. Mary. Also a train behind it. Also Target Field, where the Minnesota Twins play baseball. I could see right inside the stands! The building right across from us. 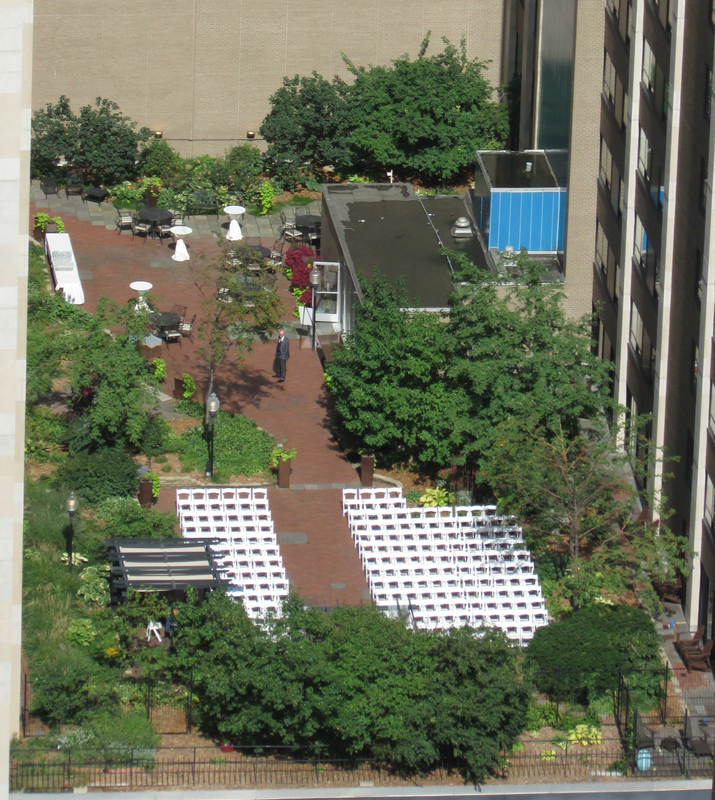 A rooftop garden at the Hilton Garden Inn right across from us. 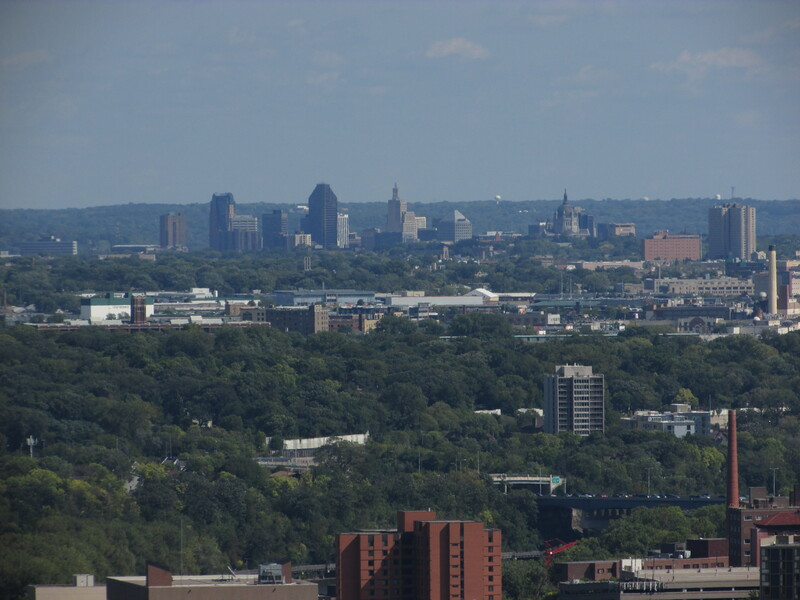 You could see St. Paul, the air was quite clear. We were going there to explore on Sunday. We completed our tour here, it was now 3 PM and we had a great time! Plan on taking a minimum of an hour here to see everything. We arrived in Minneapolis in pouring rain around 6 PM after leaving home about 12 hours earlier. On the way we saw Pickwick Mill and Pepin while traveling the Great River Road. 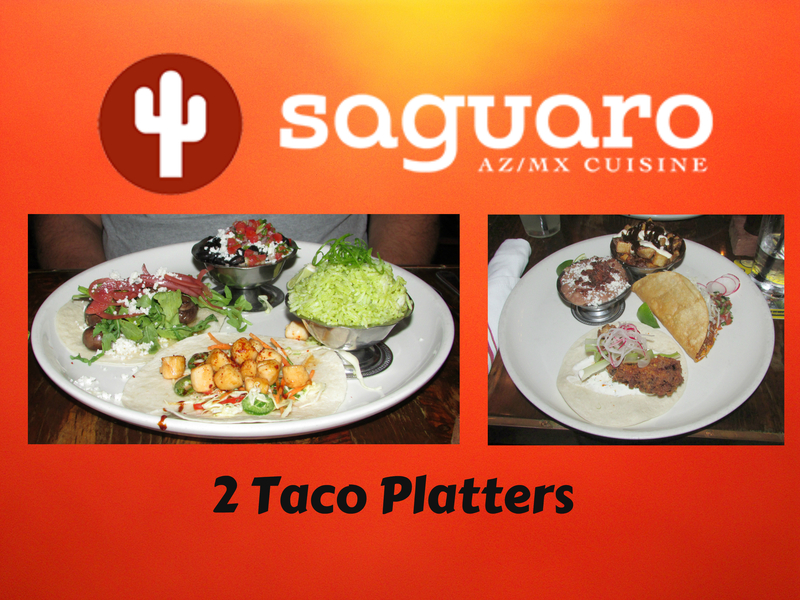 Tired and hungry, we stopped for dinner at Saguaro ( Arizona/Mexican cuisine). 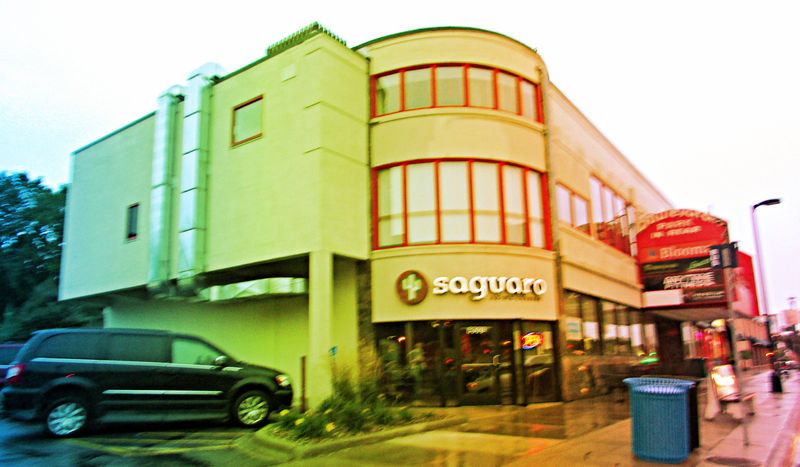 Turns out it is one of he best Mexican restaurants in Minneapolis. We have to agree! The staff were friendly and we enjoyed our experience there. Our dinners, we both chose the Taco Platter, but you could do a lot of mixing and matching. A great way to end our day and relax after a long day on the road. The rain was gone and we were ready for adventure! We took care of some family business first. 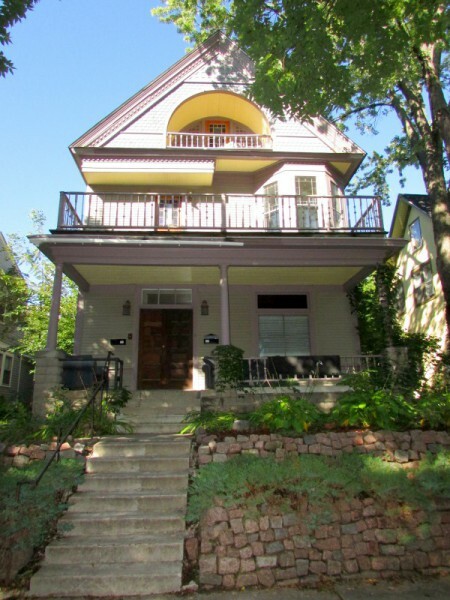 My maternal Grandmother and her sister grew up here and we went to the Lyndale neighborhood where they lived. Saw my former great-grandparent’s house, now rented by two tenants. It was good to see it again after 15 years. We also went to the other side of their block where my teen grandma picked up some groceries for the family. 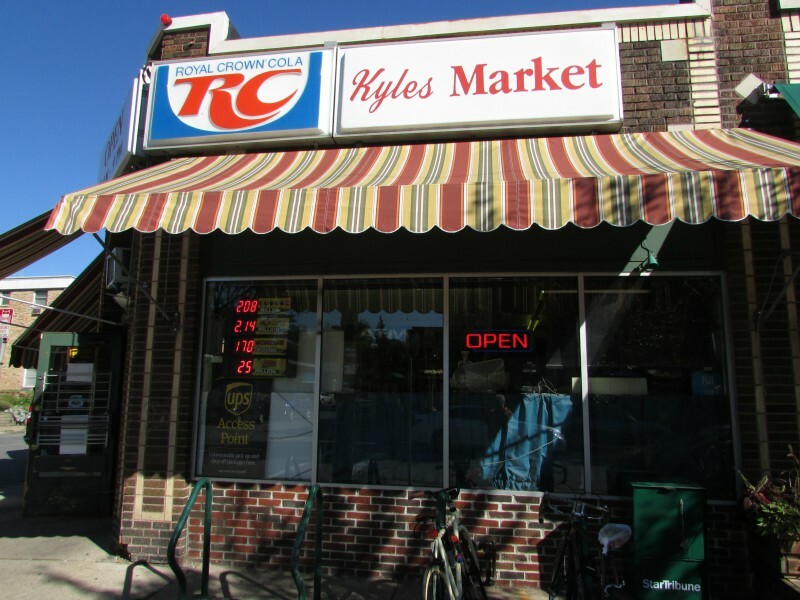 I don’t know what it was called then but now it’s Kyle’s Market, open 9 to 9 daily. We also paid respects to my great-grandparents and great-aunt at Lakewood Cemetery along the shores of Lake Calhoun. 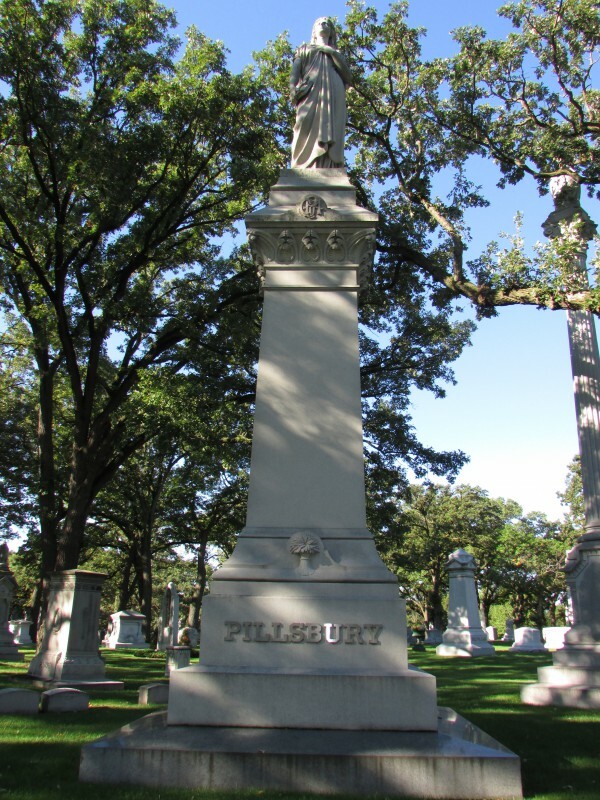 We also discovered the Pillsbury family is buried here, we could see the tall monument from my family’s grave site. More on Pillsbury later. On our way to our next place we saw a vintage White Castle Hamburger building, now Xcentric Goods. 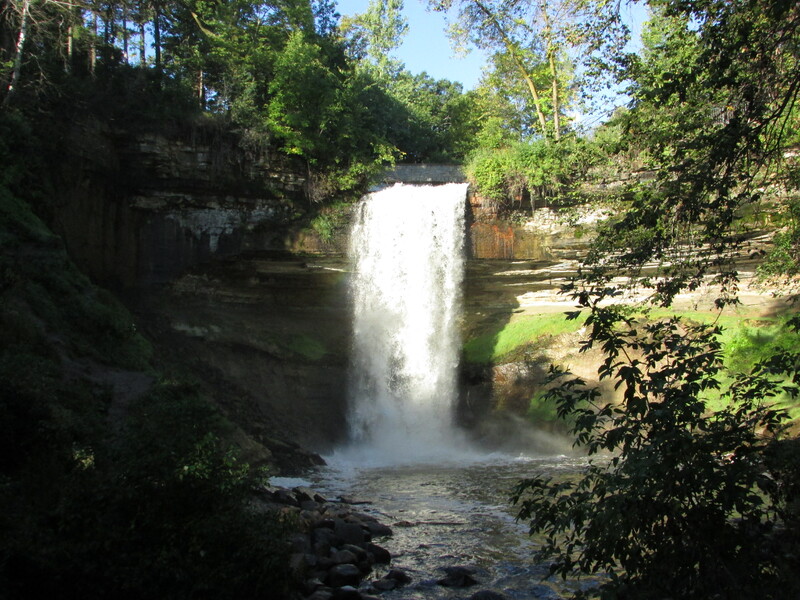 We soon arrived Minnehaha Park, a popular park for over a century. 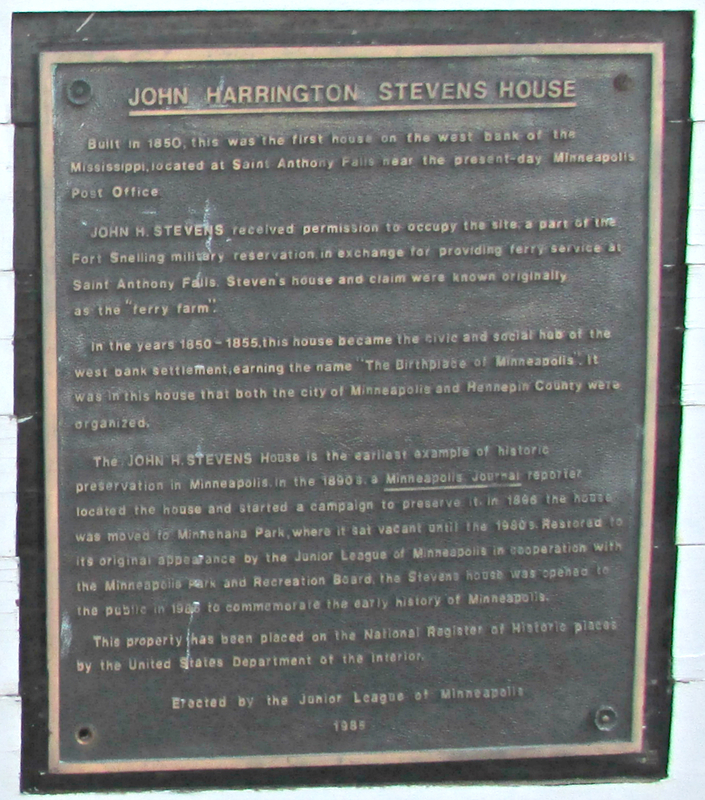 It’s also the center point of the founding of Minneapolis. On location is the Princess Depot that used to bring people to the park on a train. Now, it’s a museum open seasonally. 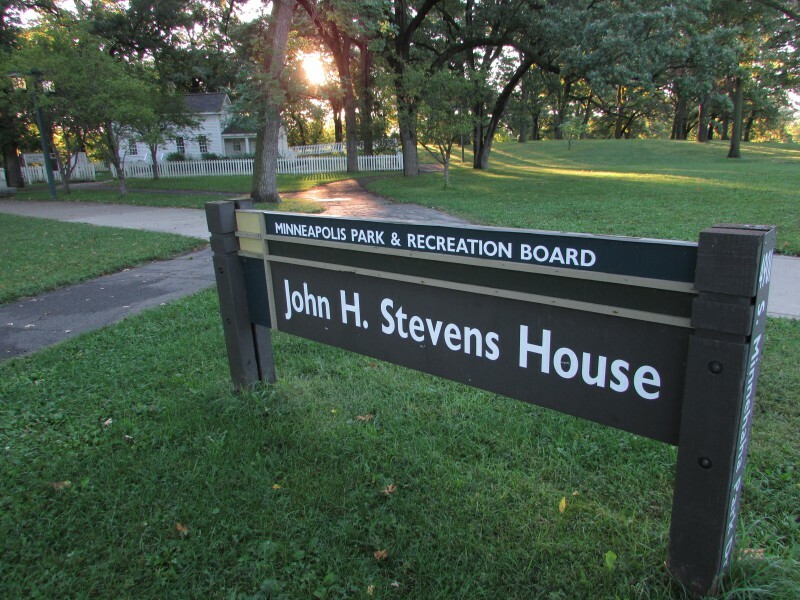 The first settler of Minneapolis, Colonel John H. Stevens is memorialized here with his former home turned into a museum. Also a statue in front of the house. 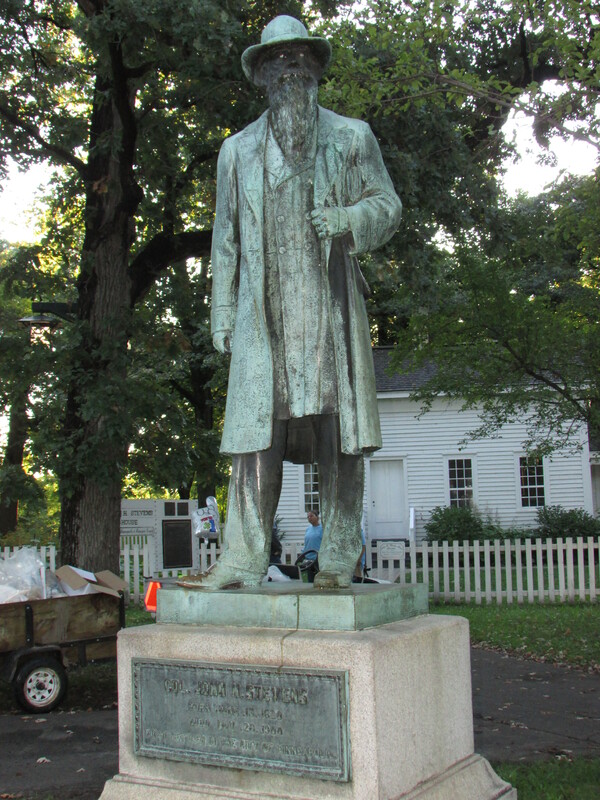 We happened to be there when the groundskeepers were making their rounds (you can see them behind the statue). Even though the museum was not really open for visitors at 7:45 AM, they did for us since they are just nice people 🙂 Lets go in! There is a plaque just outside of the door. That was fun, thanks for the great tour! 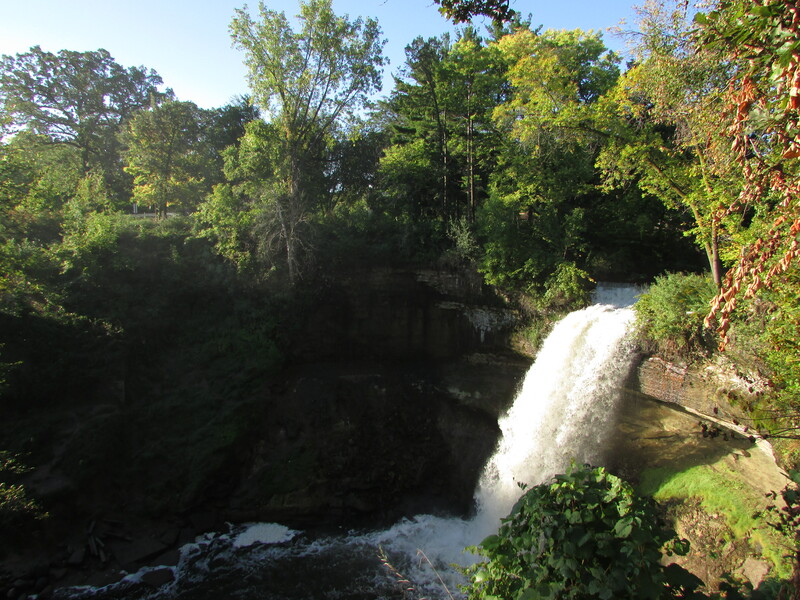 Now we proceeded to the other great attraction of this park, Minnehaha Falls. As we got closer, you could hear the rush of water. The sunrise was illuminating the mist the falls created, beautiful! 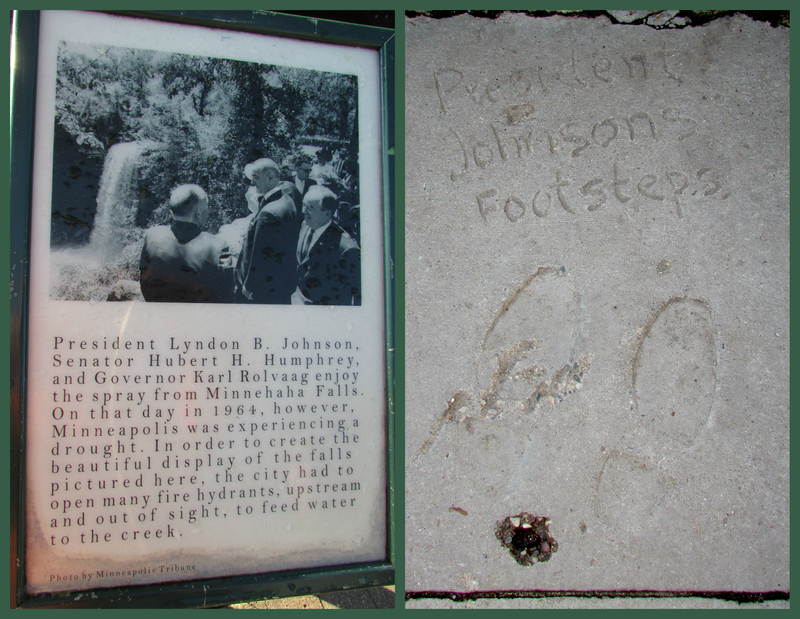 An interesting fact, President Johnson visited the falls in 1964, they marked where he stood in concrete and you can stand there too. There were stairs going down to the bottom of the falls, offering this view. 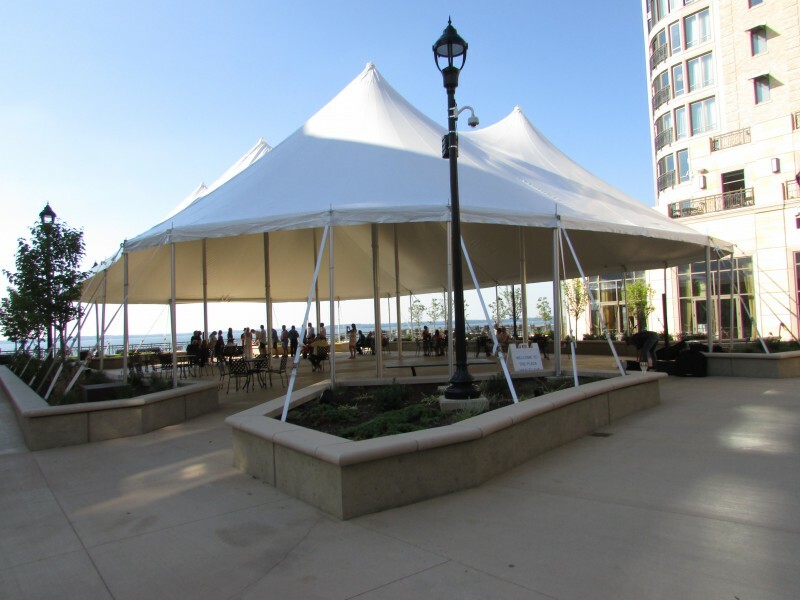 The park also has a large pavilion for events. It was now almost 9, time for our next attraction. We were treated to a great skyline view on the way! 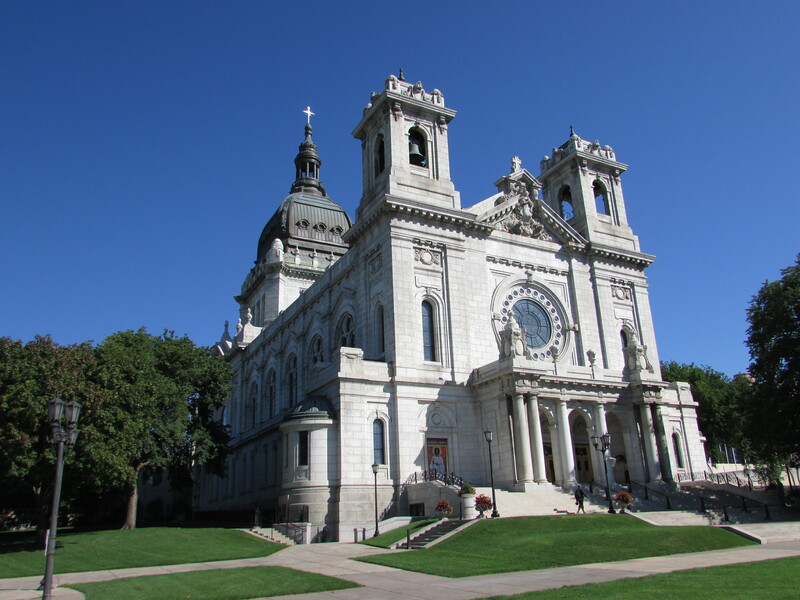 The Basilica of St. Mary was our next stop, very beautiful! 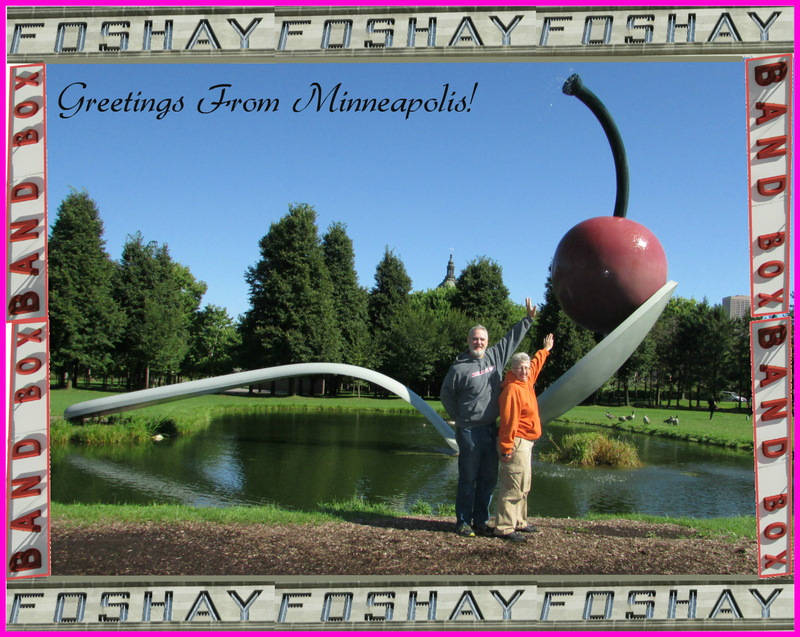 We crossed the street to Walker’s Art Center and Sculpture Park to take our picture with the trademark Spoonbridge and Cherry sculpture. We were not the only ones taking selfies here 🙂 here is ours. The frame around the picture tells you what was coming up next. 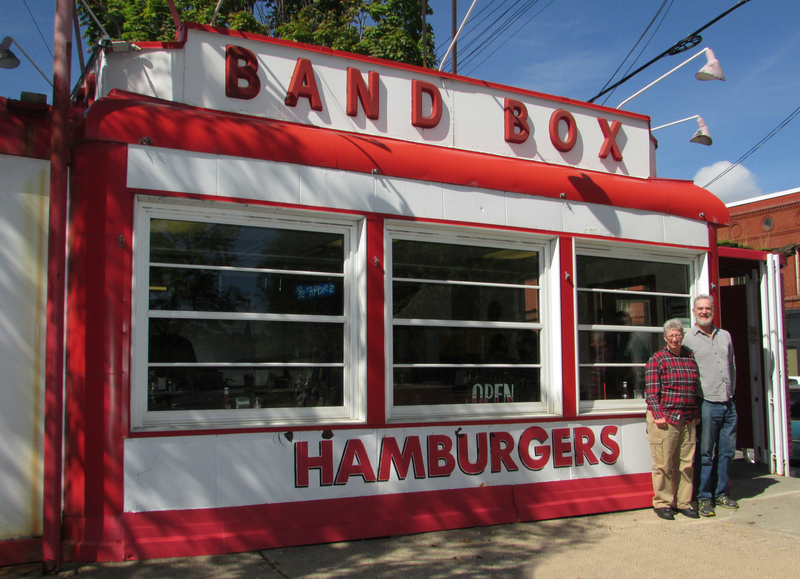 It was time for lunch and we had it in the historic Band Box Diner. There is only one in the whole city, and world! We are lucky to have been able to eat there at all. In March 2015 the 30-year old grill stopped working and they didn’t have enough money to buy a new one. Not to worry though, the customers banded together and raised the funds to buy a NEW GRILL! We are so happy they did, this landmark restaurant is too good to close! 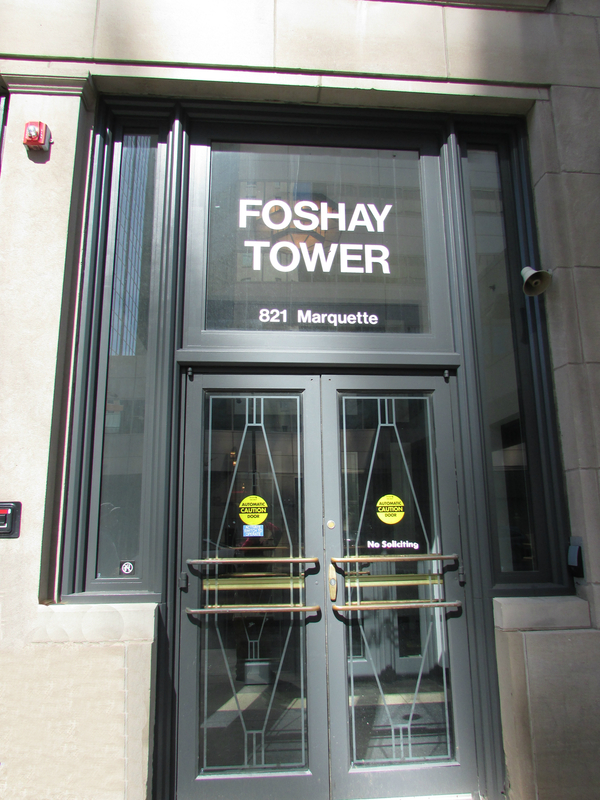 After lunch, time for our biggest attraction for today, Foshay Tower. 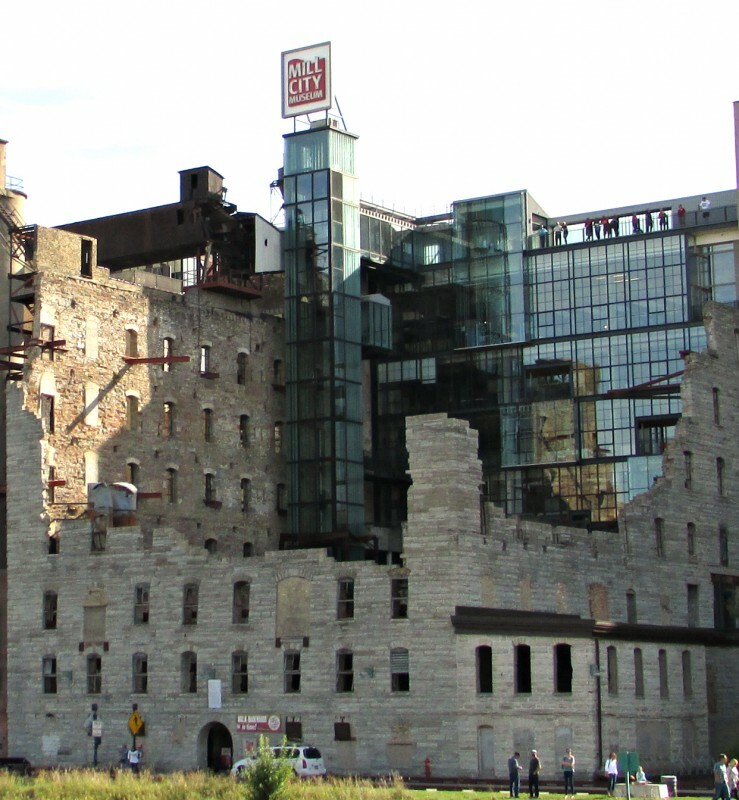 The W Minneapolis Hotel is also in this building. 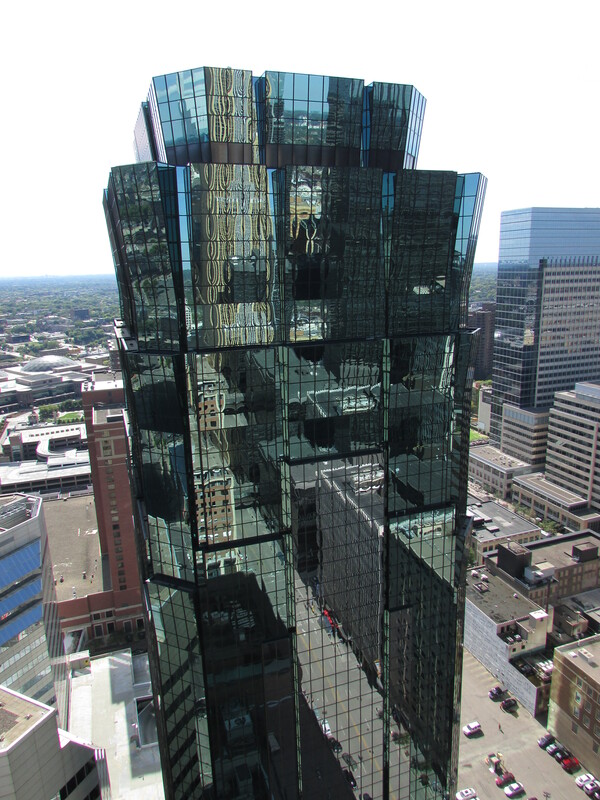 It has the only sky deck in the Twin Cities for visitors to enjoy, the view is from 30 stories up. 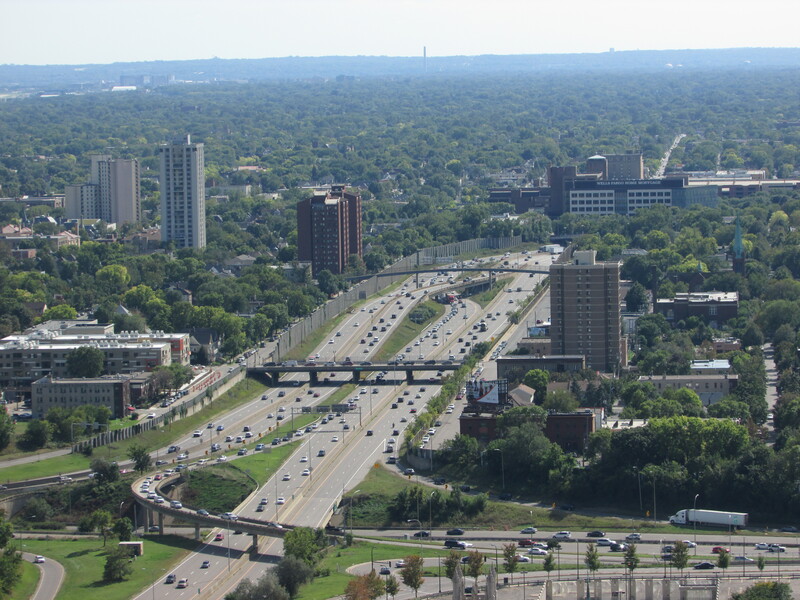 For adults not staying there, it’s $8 to go to the sky deck. What a wonderful view! 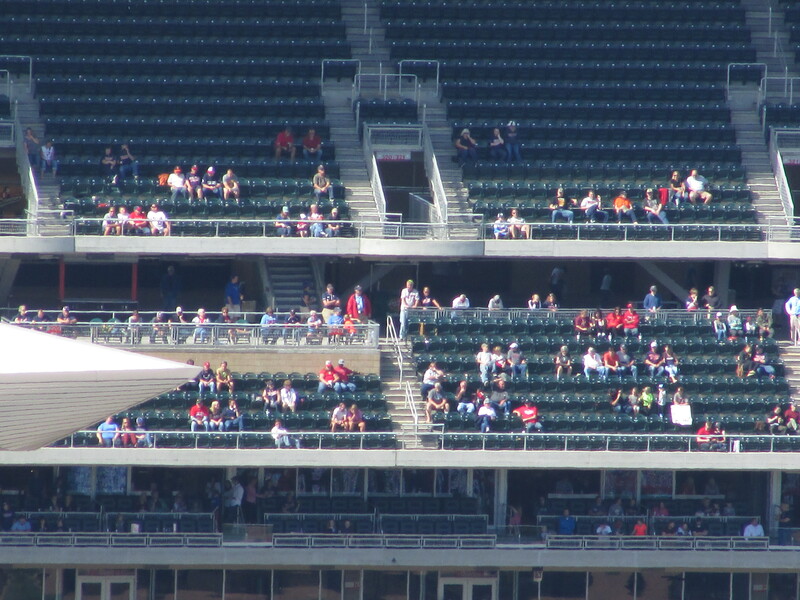 You could see St. Paul, also the Minnesota Twin’s Target Field inside the stands. 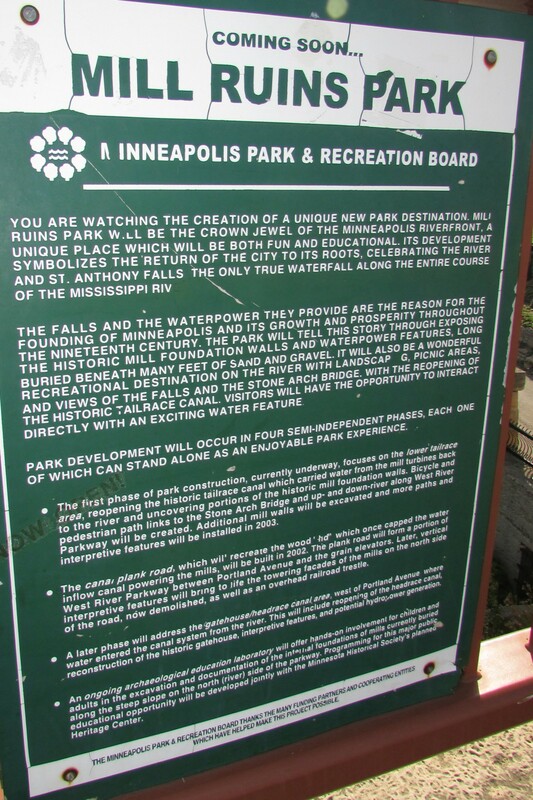 Our last stop for the day was St. Anthony Falls and Heritage Trail. 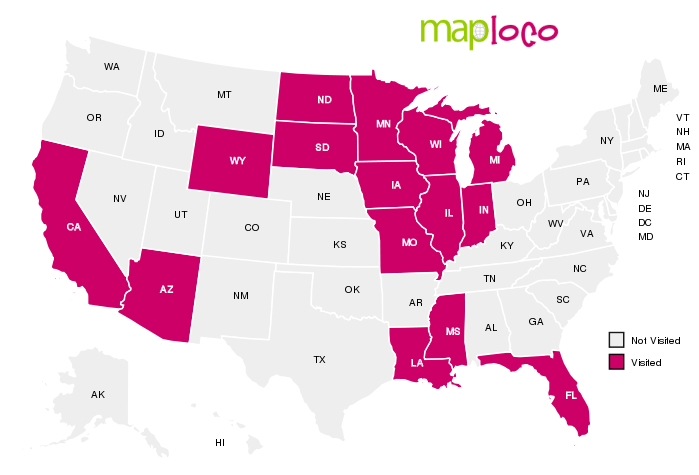 Here is our location. By then it was 3:30 and we had until 5, when we went to have dinner with some relatives. A beautiful afternoon with many people there enjoying the day. On the other side of the bridge you could see the remnants of the former flour-milling era. 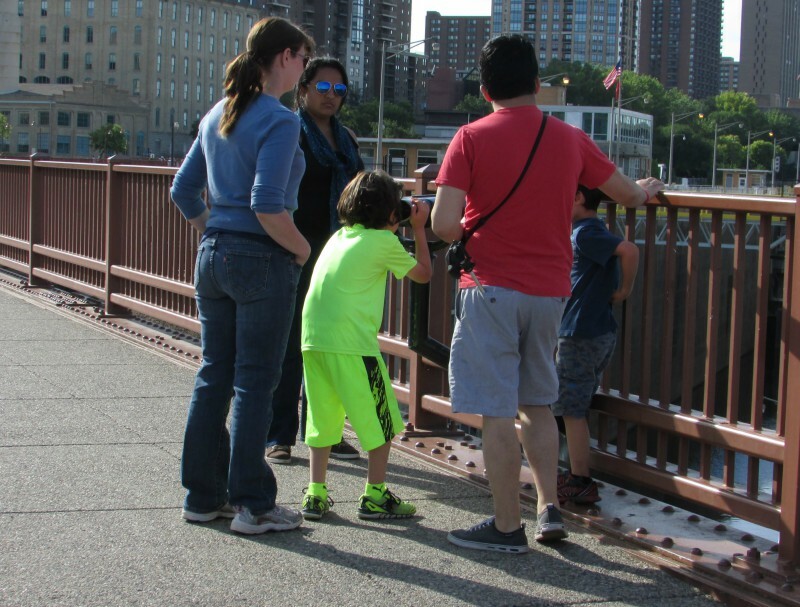 Along the trail are also free viewing scopes that kids really enjoy looking in. 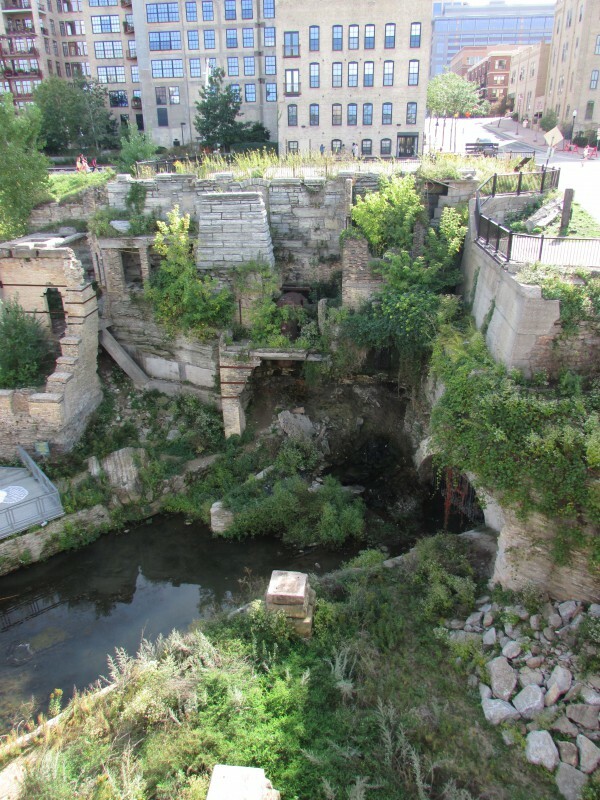 The trail goes by Mill Ruins Park, which is still undergoing development but the first phase is what you see here. It is also a popular wedding venue, you could see the wedding party taking photos below. 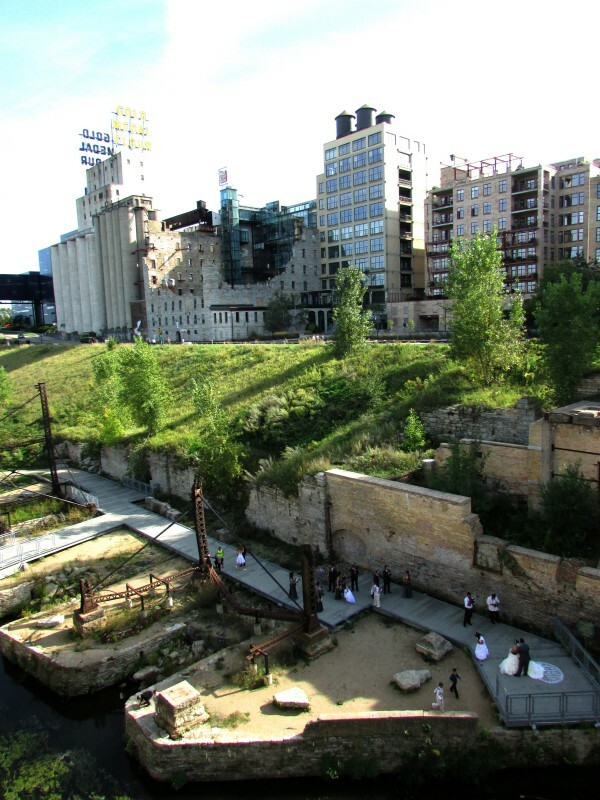 You could also see Mill City Museum from the trail, not enough time to stop there unfortunately. You could see people up there! 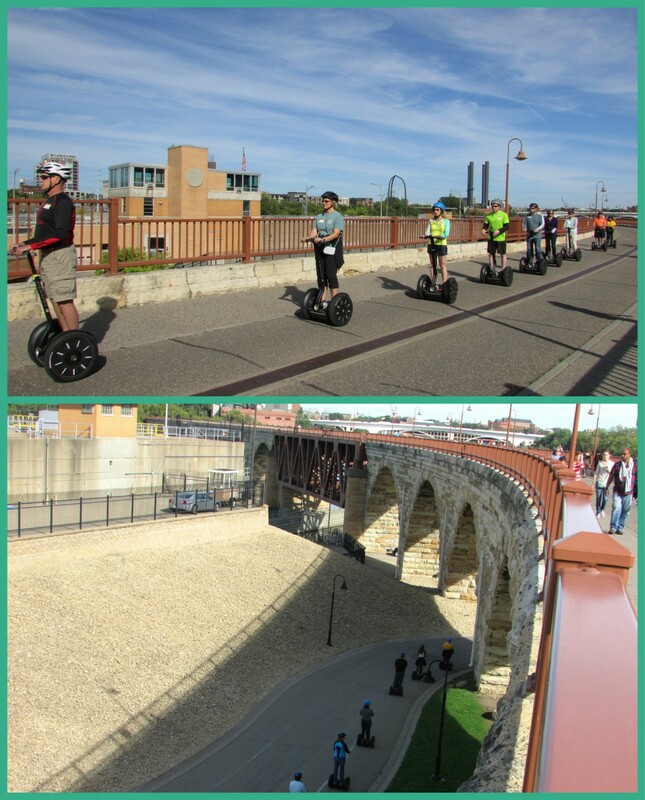 A Segway Tour just went by us, they made a turn and went under our part of the trail on the Stone Arch Bridge. It was time to be on our way. 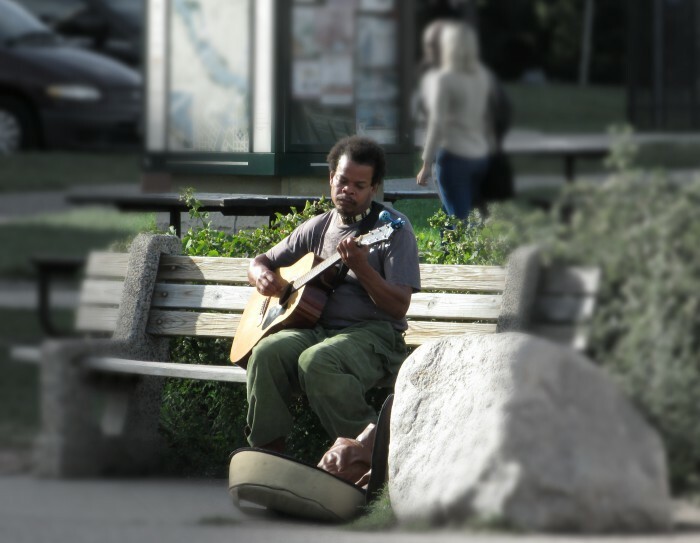 We hear music from a street musician playing on his guitar as we head back. 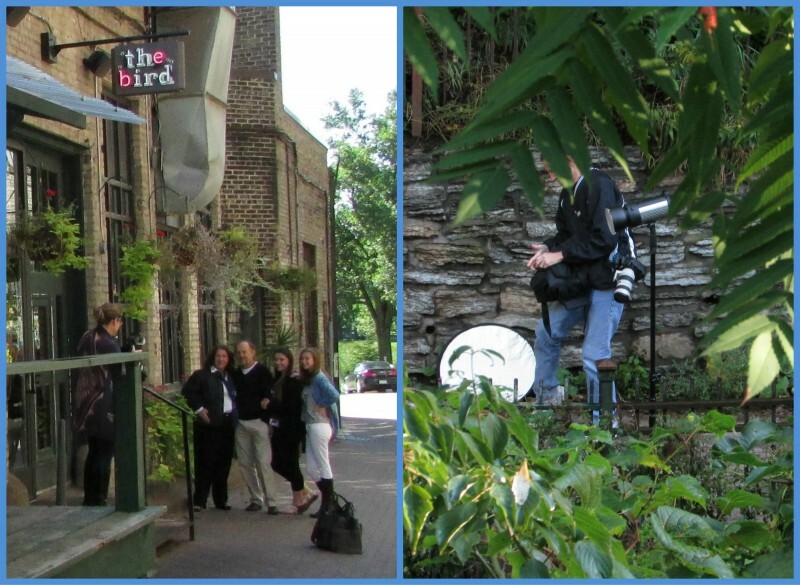 One thing we noticed about this friendly city, photo shoots! We saw three today, there may have been more we didn’t know about. We had a great day, on Sunday we were going to see some of St. Paul before going back to Madison. 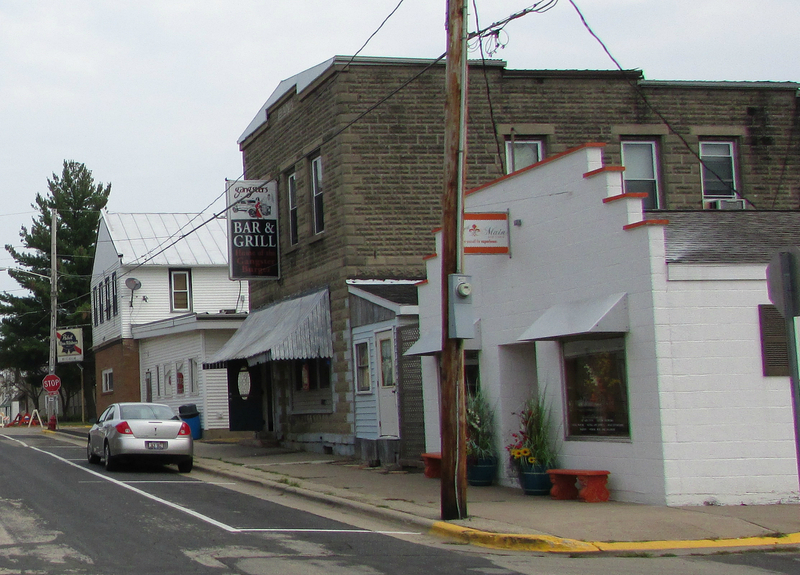 Hazel Green is a village of 1,256 in Grant and Lafayette counties that is important to Wisconsin’s development as a state. 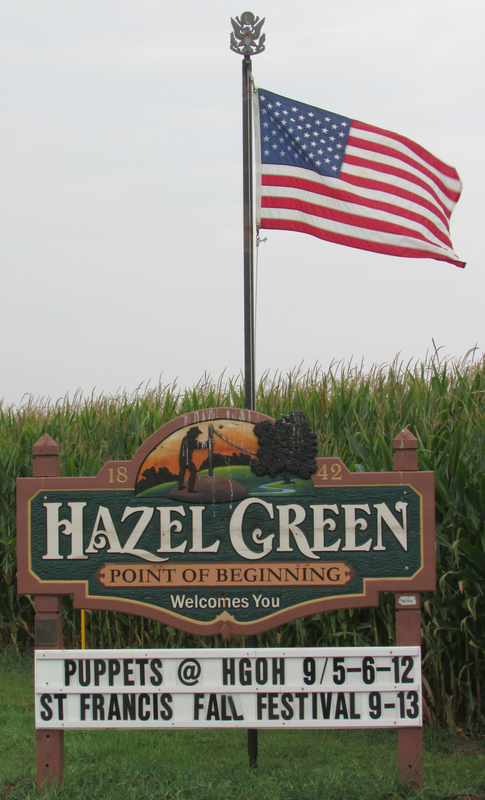 Formerly called Hard Scrabble, Hazel Green has a rich history described here. 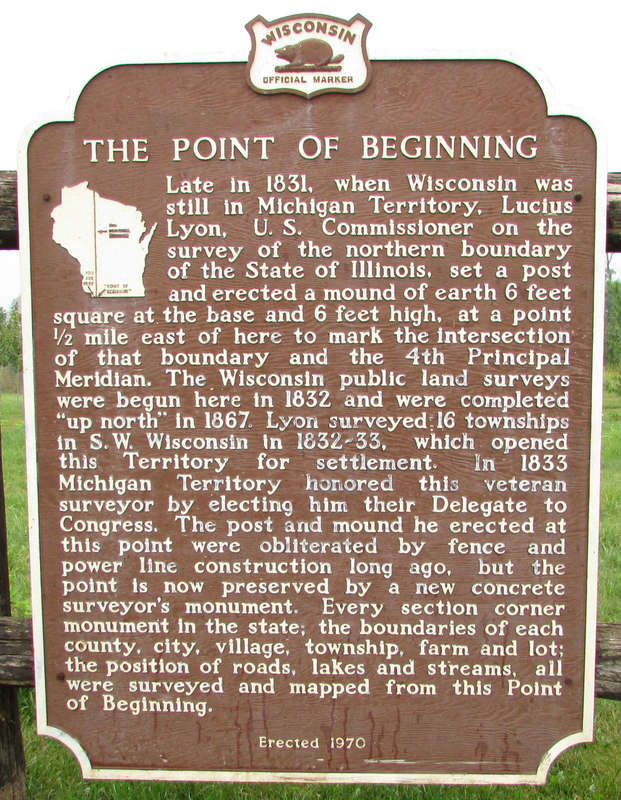 It is the oldest community in Wisconsin, settlement began in 1825. The community was one of the many with residents engaged in zinc and lead mining. 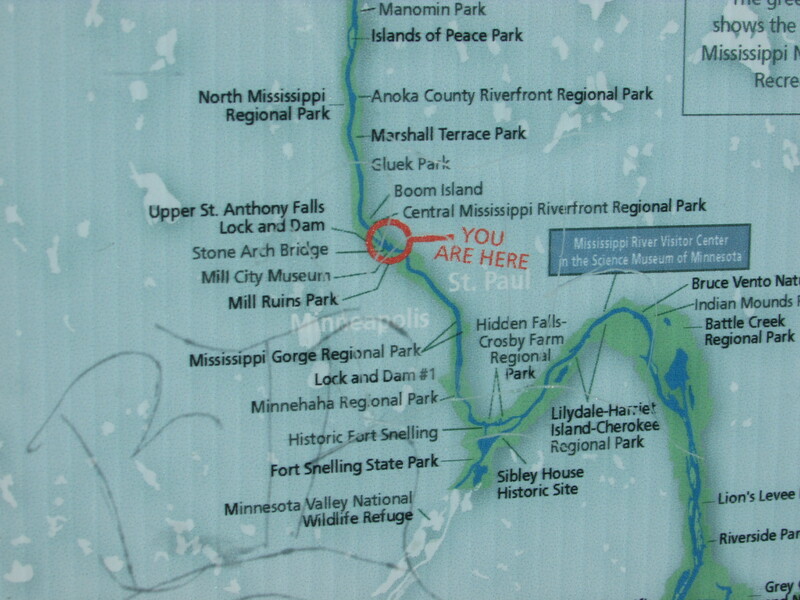 It was also along the stagecoach route leading to the Mississippi River. 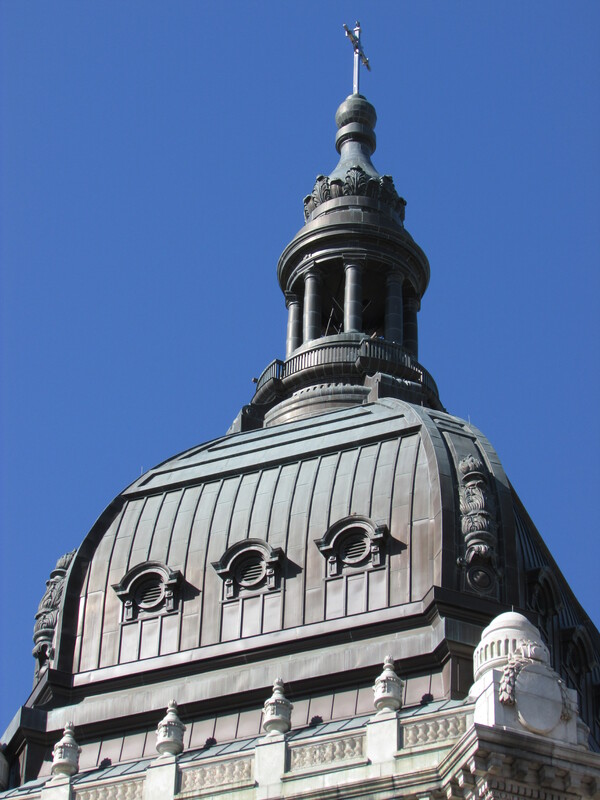 It is close to Dubuque and the Great River Road and the many communities and attractions along it. 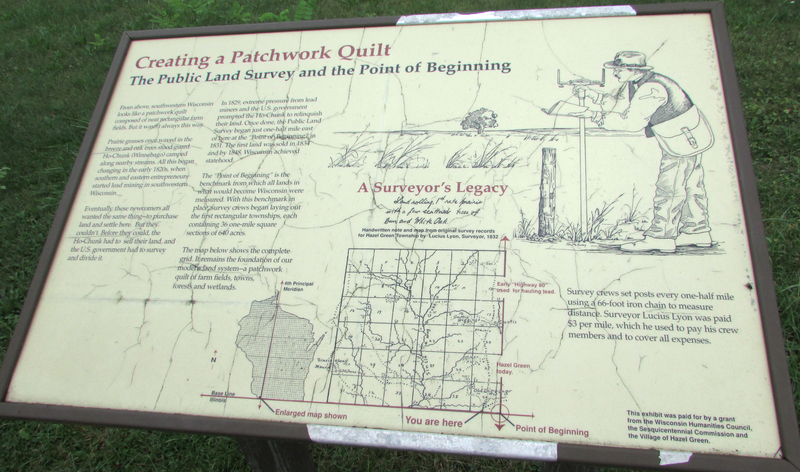 We learned more at the historical marker at the southern edge of town, within sight of the Illinois border. 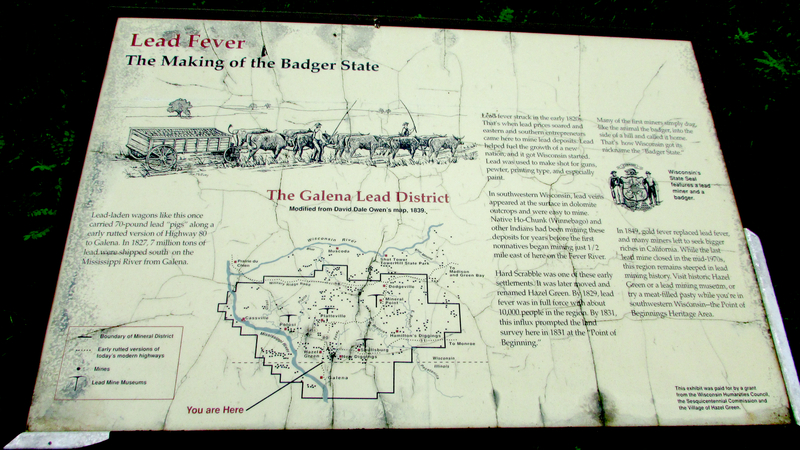 There were also two signs describing the former mining industry here. Hazel Green has several unique businesses, especially this cute vintage gas station at Symon’s Service Center. It wasn’t open but it appears to be a display and not functional. 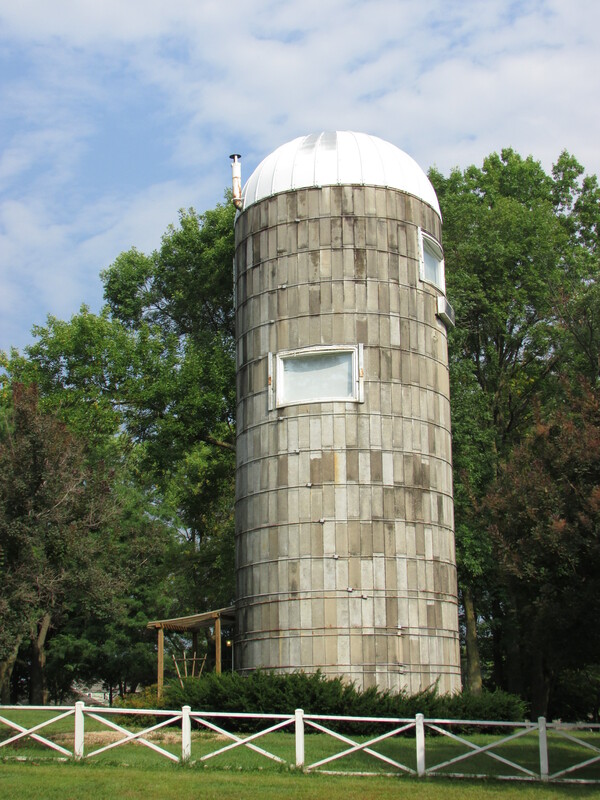 The Ambrosia Inn has a “Silo Suite”, a converted silo you can stay in. Downtown Hazel Green is currently torn up on half of Main St. so pardon the dust 🙂 On the still paved part are several businesses. 20th Main Hair Studio, Gangster’s Bar and Grill-Home of the Gangster Burger, and Wigwam Bar. We did have lunch at Gangsters and the their Gangster Burger was indeed delicious! Al and I split it it was that big. We even enjoyed strawberry shortcake! To them, good food is just as important as good service. Very friendly staff too, be sure to stop in if you are in town. The other half of Main St. 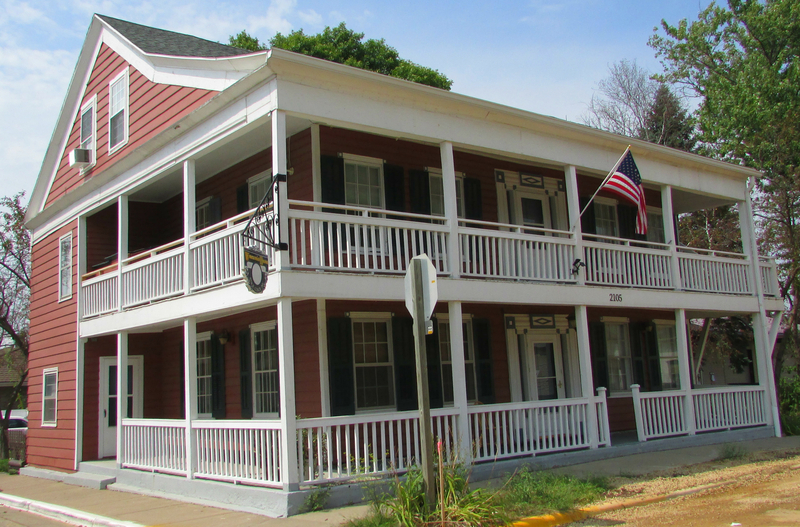 The Wisconsin House Stagecoach Inn, serving the community since the 1800’s. 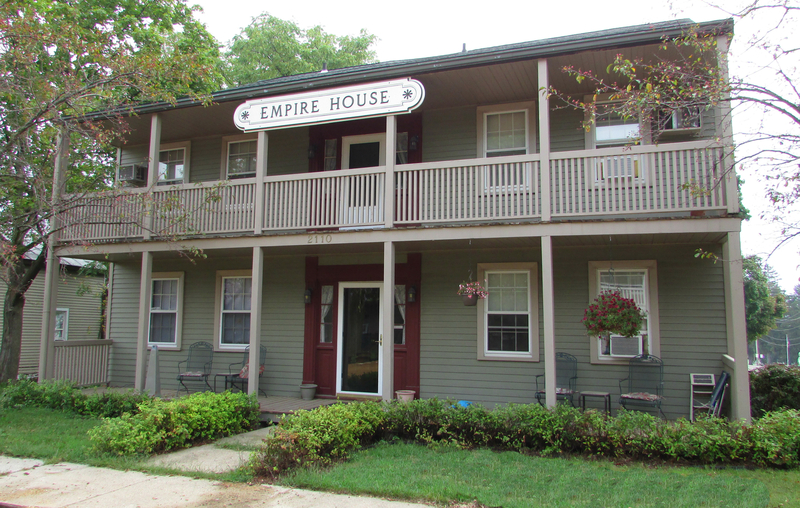 Across the street is the Empire House, now an apartment building. 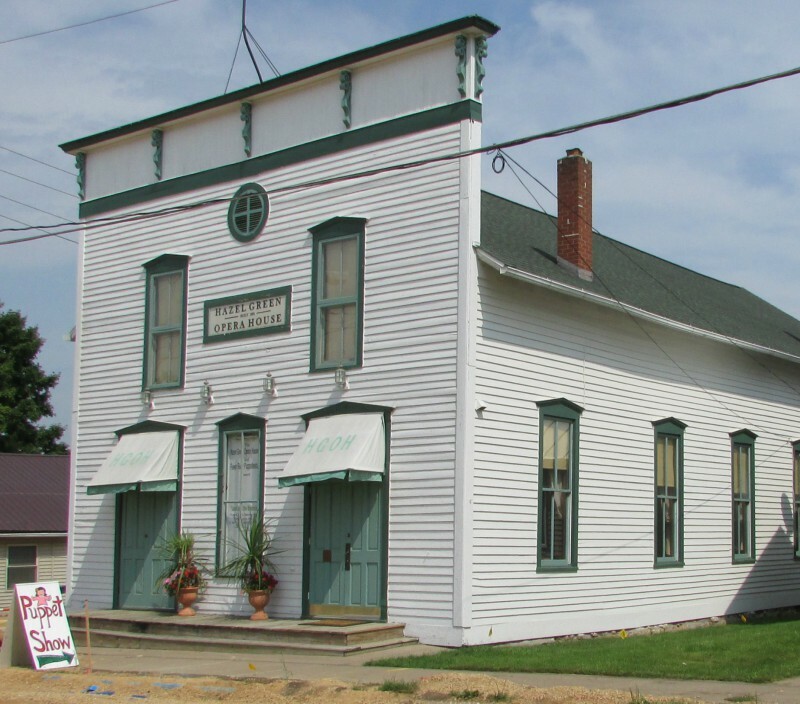 In the community’s early days, it served as a Town Hall, where the first town meeting has held. 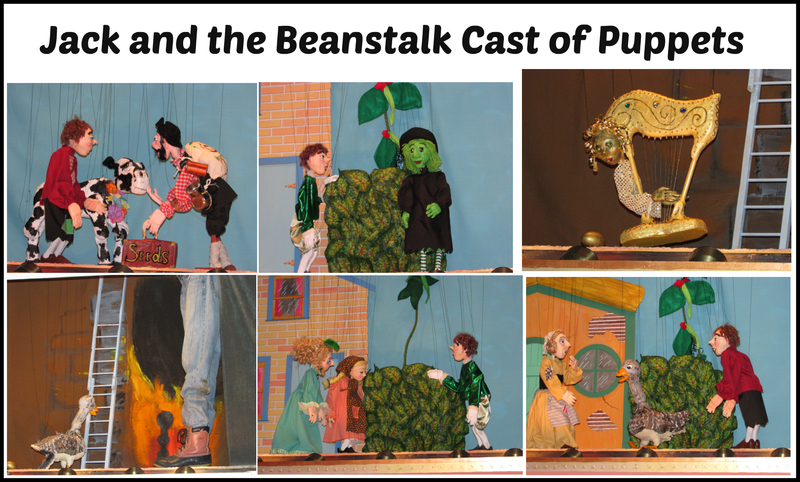 Our main reason for coming here today was to go to the Hazel Green Opera House, where the Fever River Puppeteers were to put on a performance of “Jack and the Beanstalk”. They put on performances generally from March-December here and in Benton, their home base. We had a great time, even without our own children to share it with. Our visit concluded, we headed out of town toward Potosi. 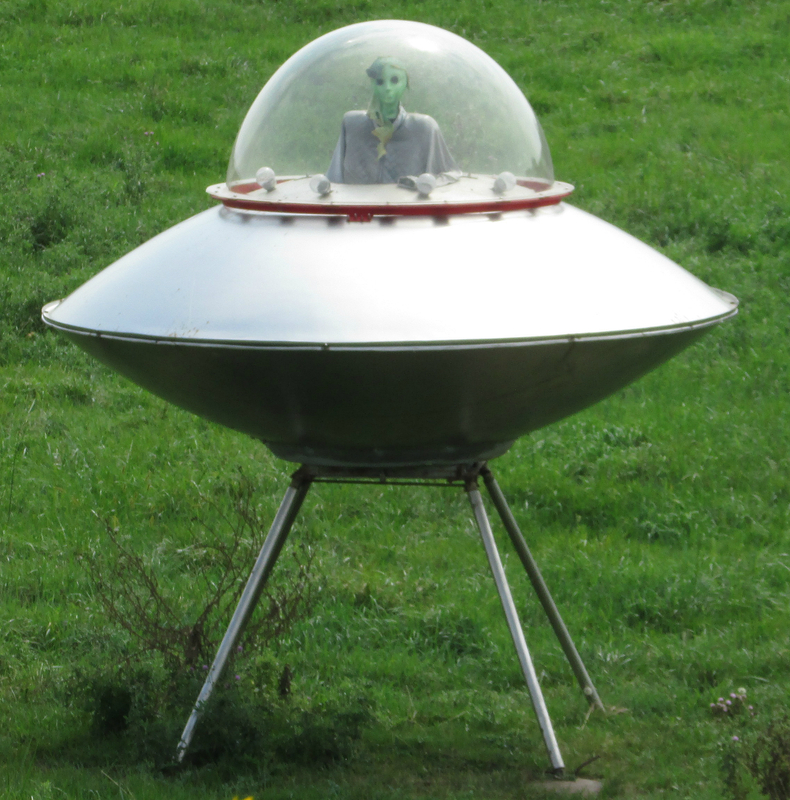 We also saw some metal sculptures of dinosaurs and a flying saucer in a farmer’s field. You can’t go over the fence but you can take pictures from behind it. 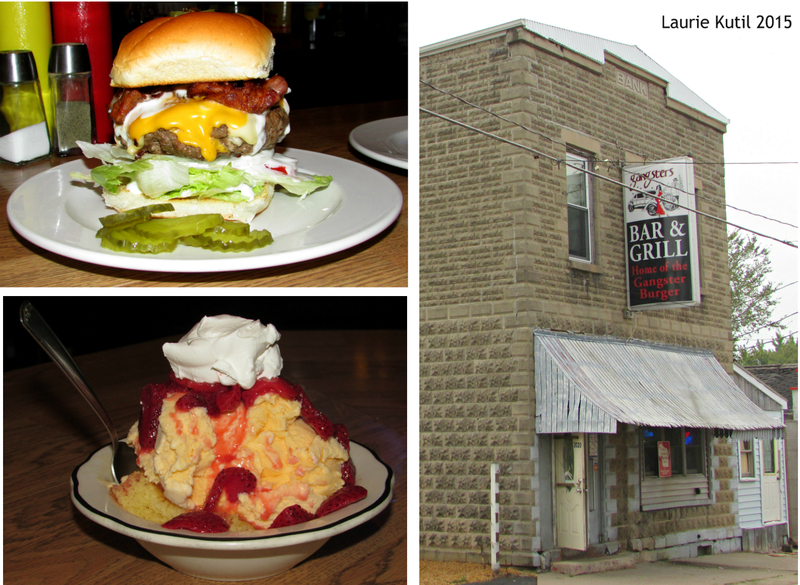 Fly into Hazel Green for a good time in a friendly community, and be sure to eat a Gangster burger too!